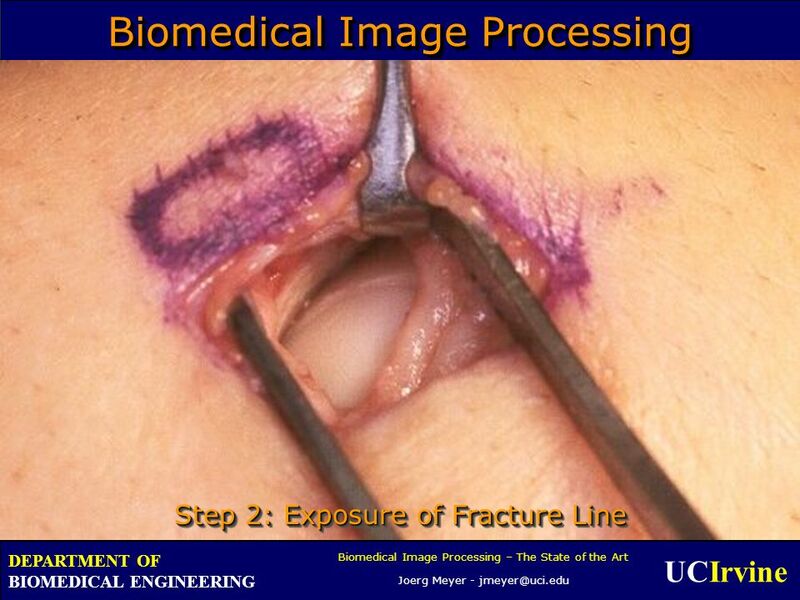 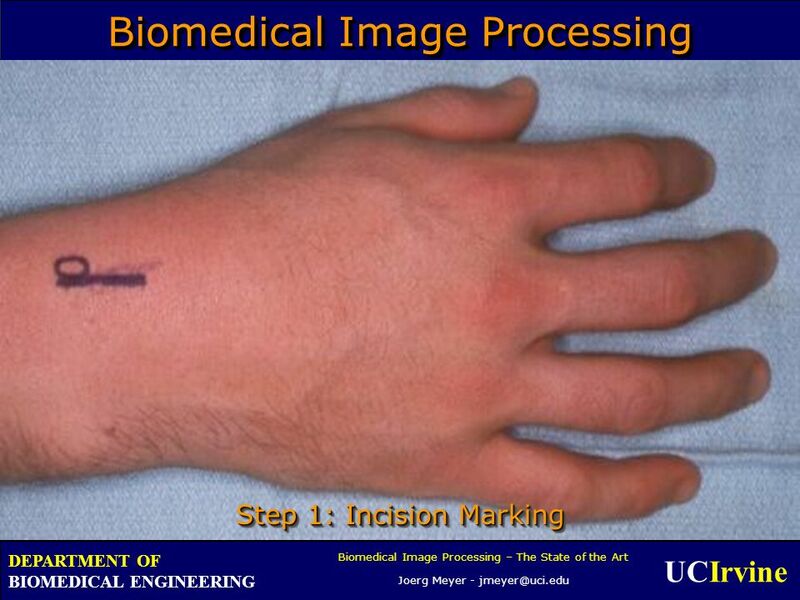 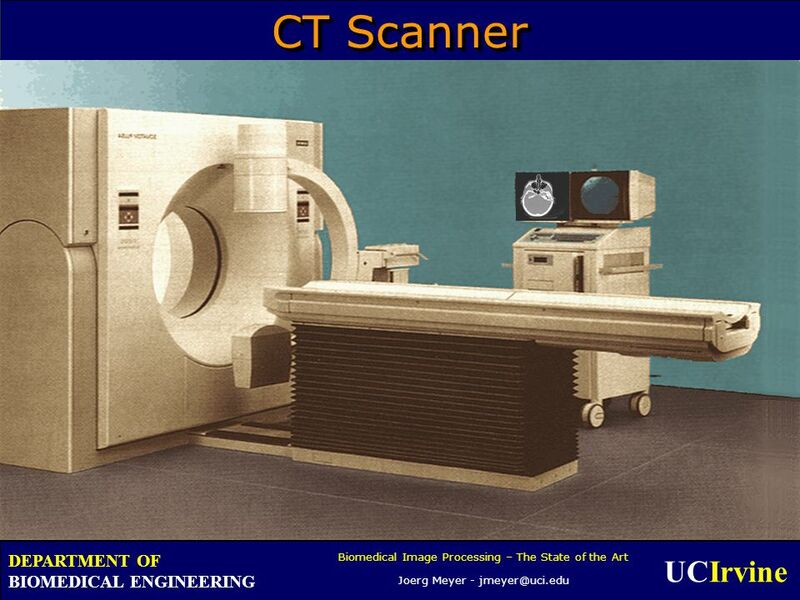 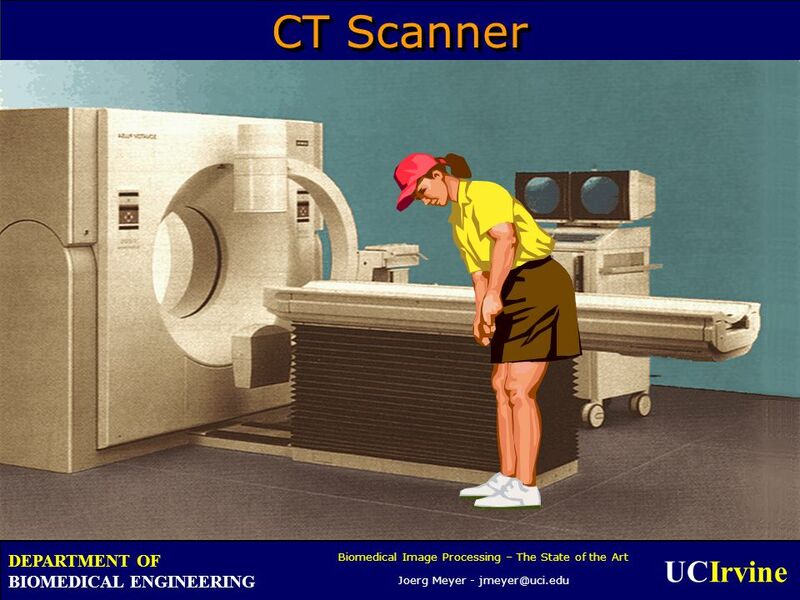 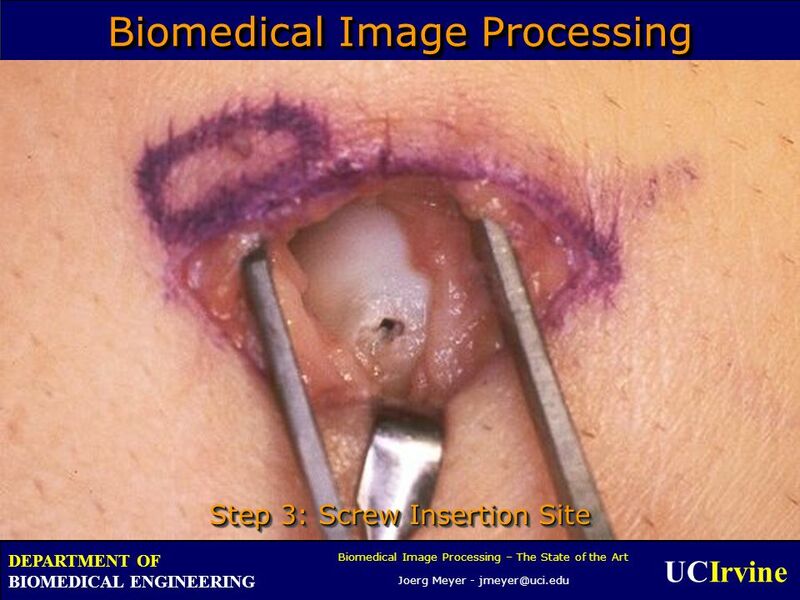 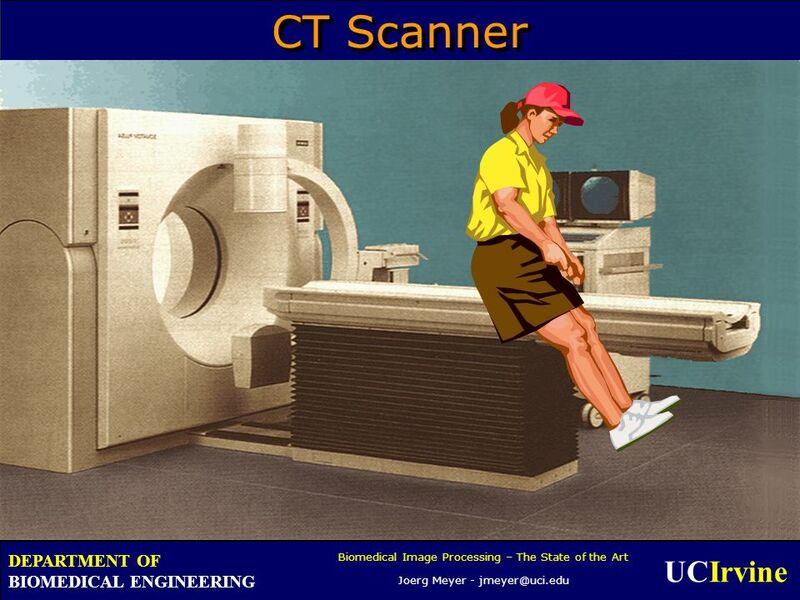 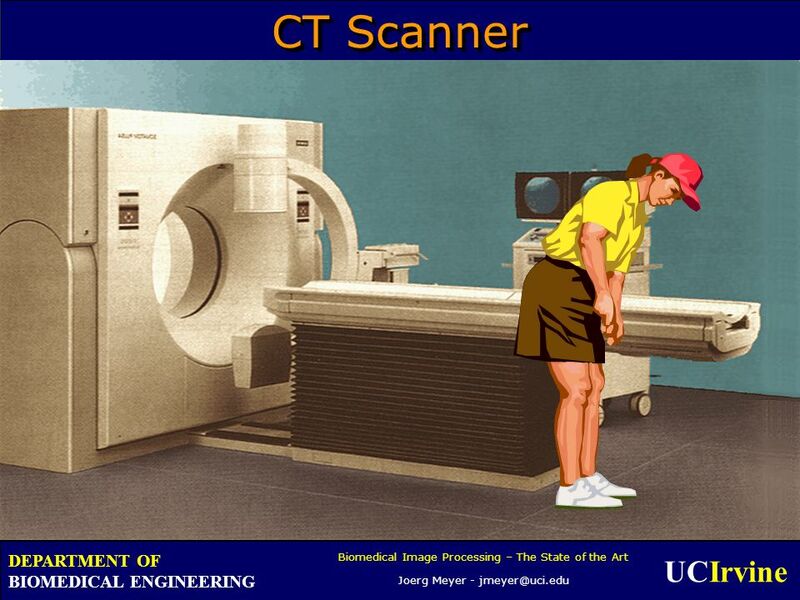 UCIrvine DEPARTMENT OF BIOMEDICAL ENGINEERING The State of the Art Joerg Meyer February 8, 2014February 8, 2014February 8, 2014 Joerg Meyer. 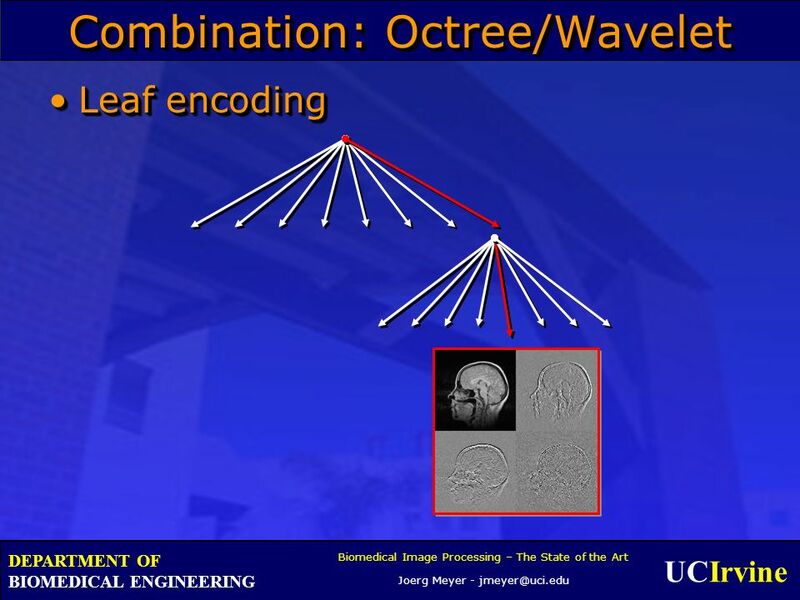 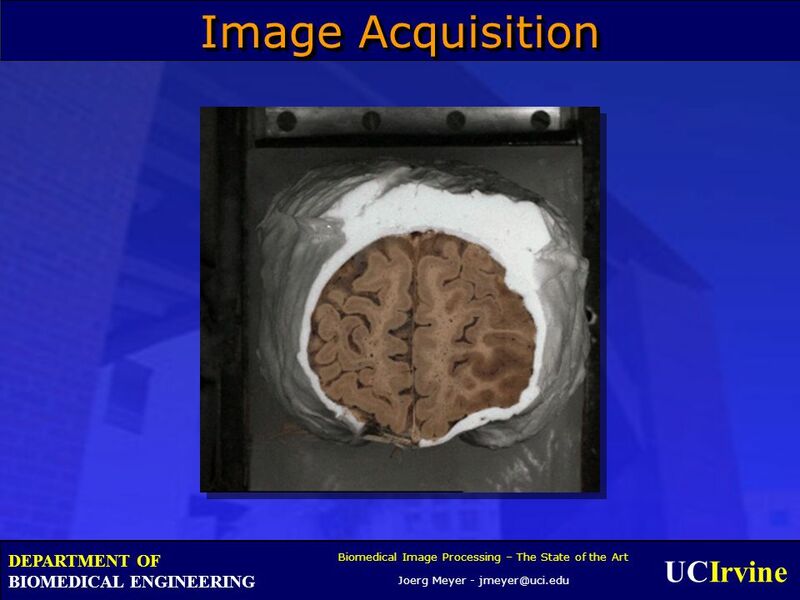 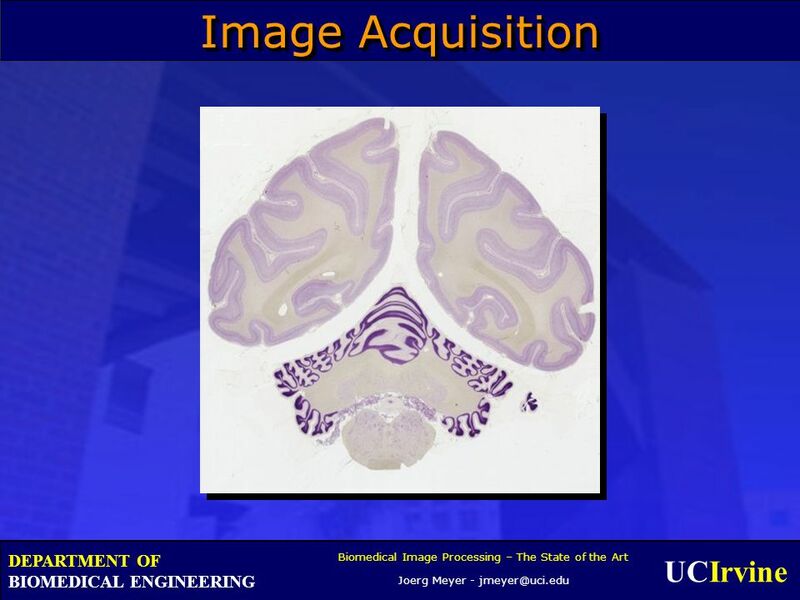 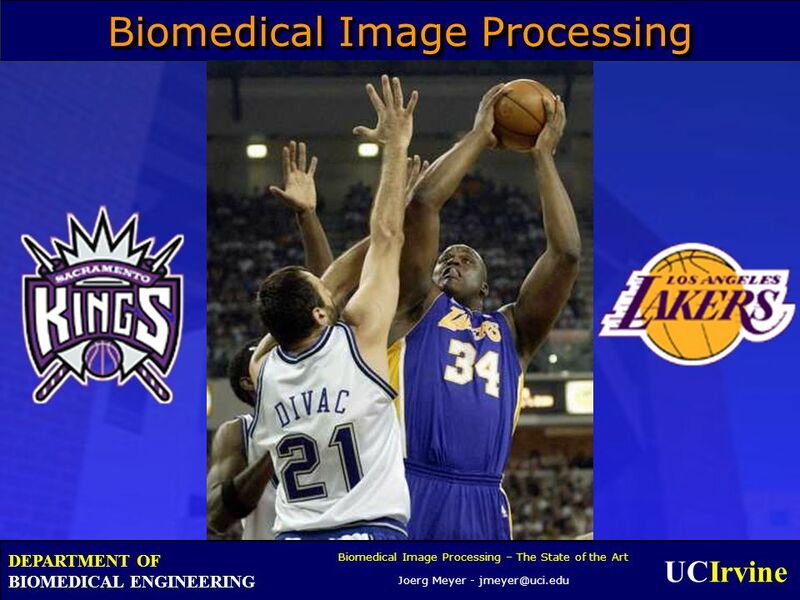 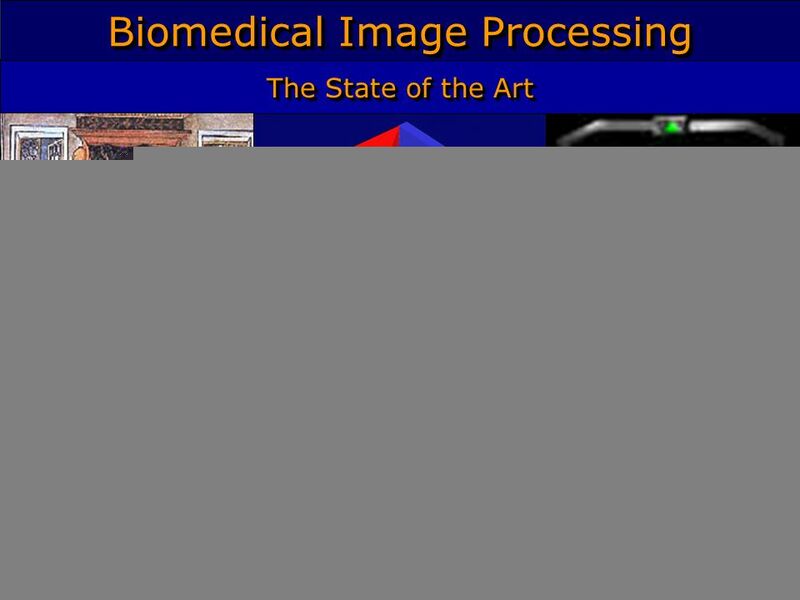 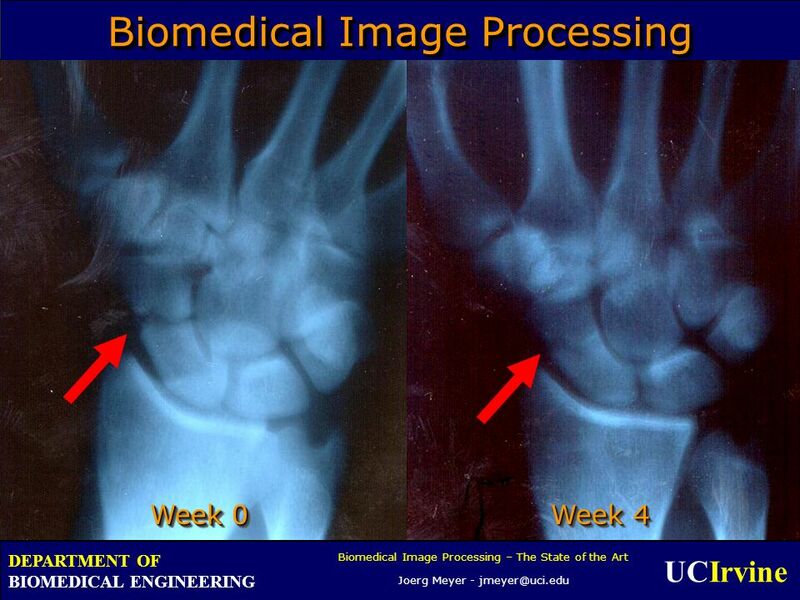 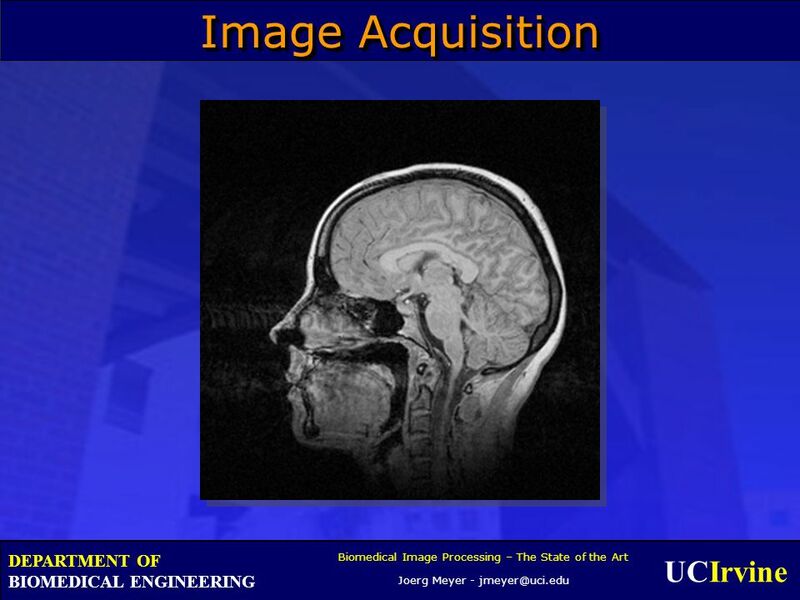 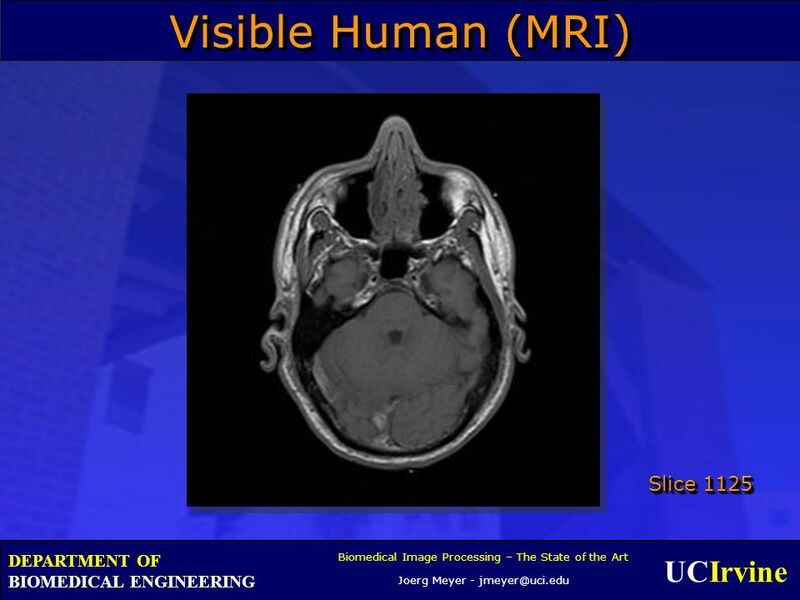 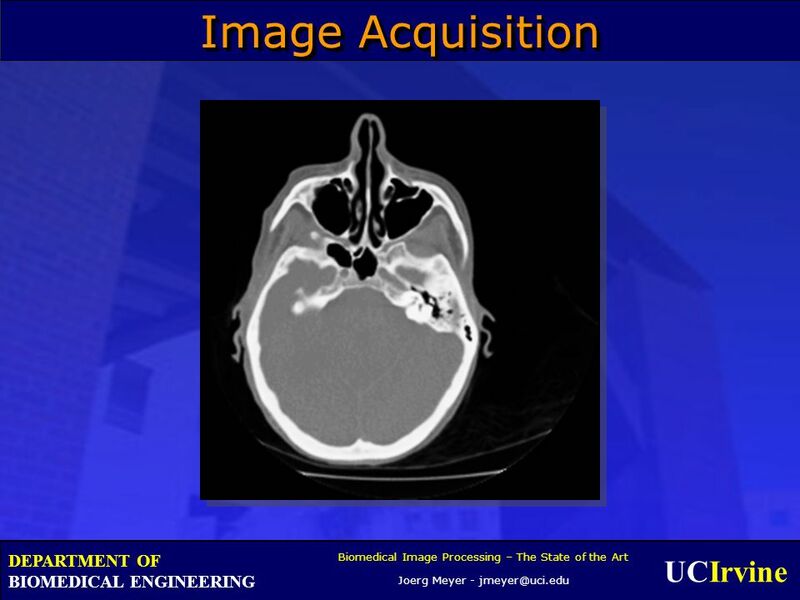 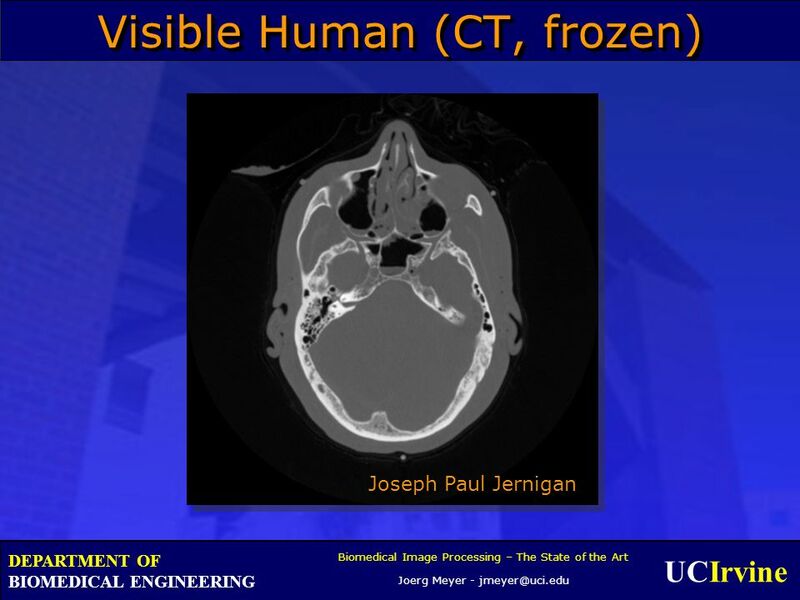 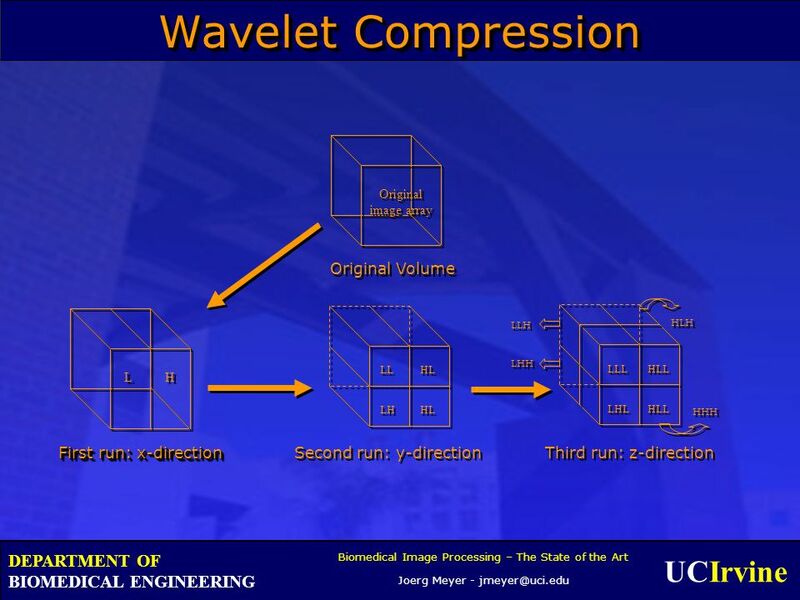 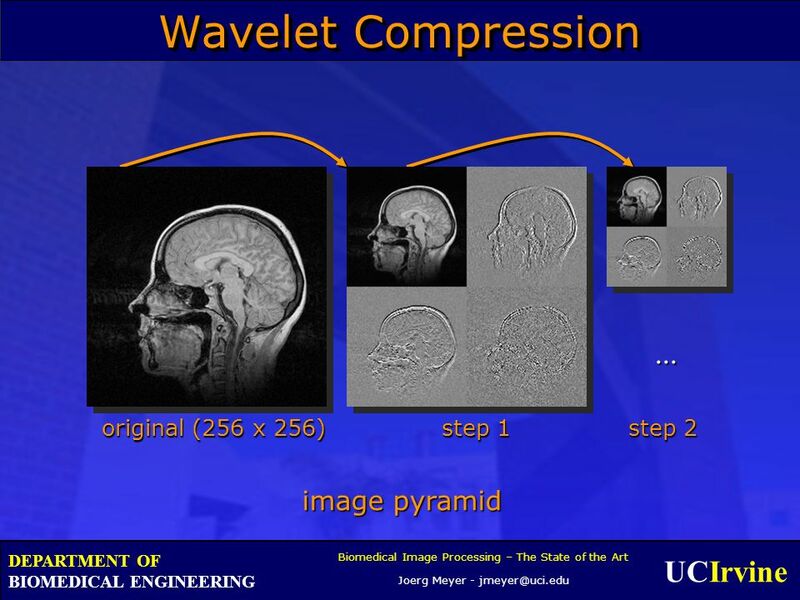 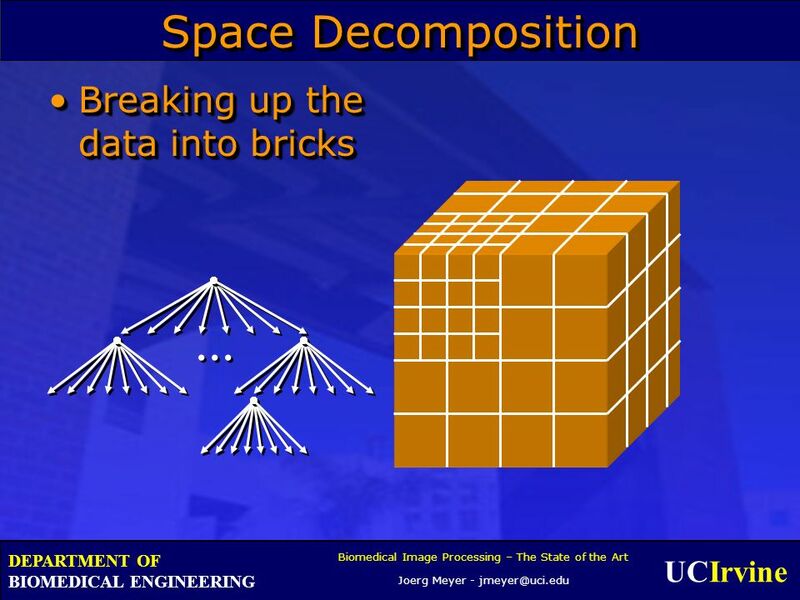 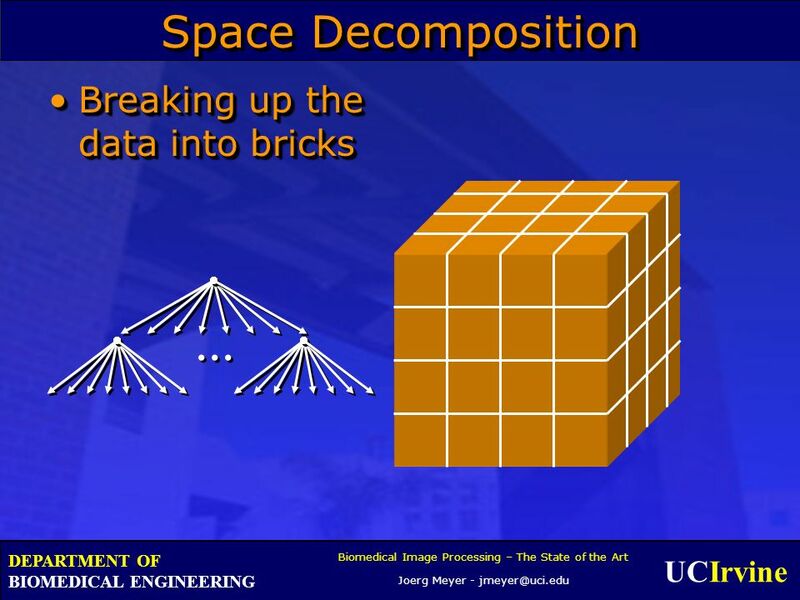 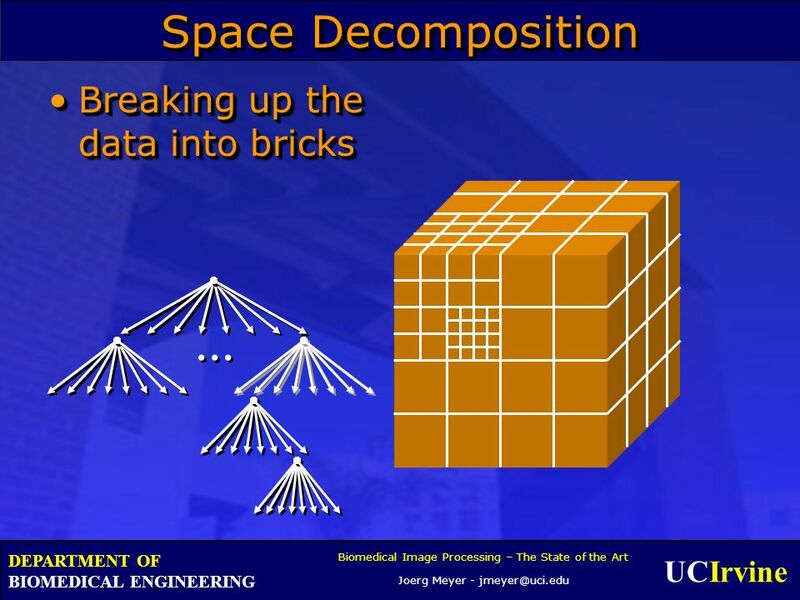 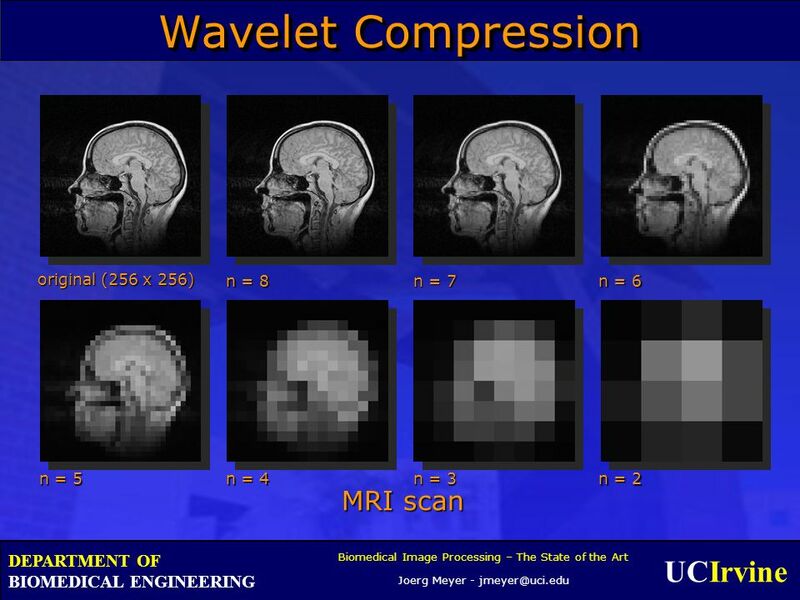 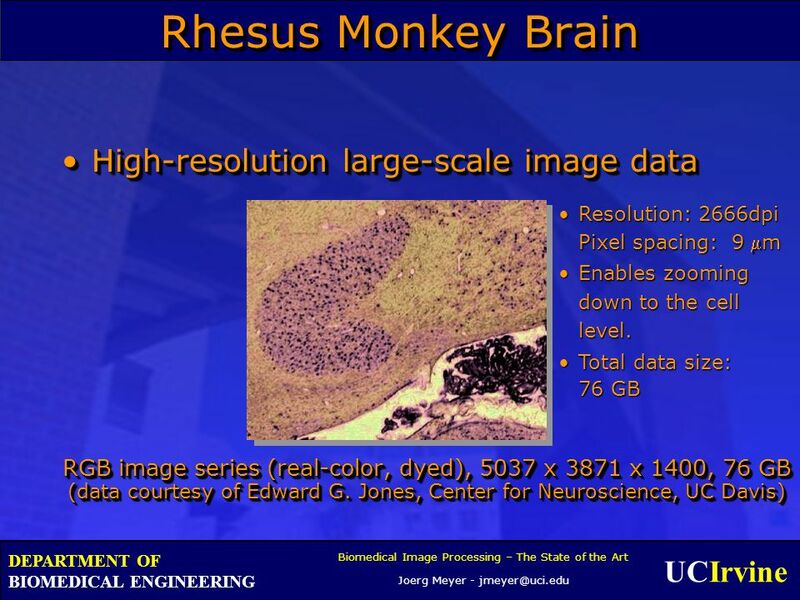 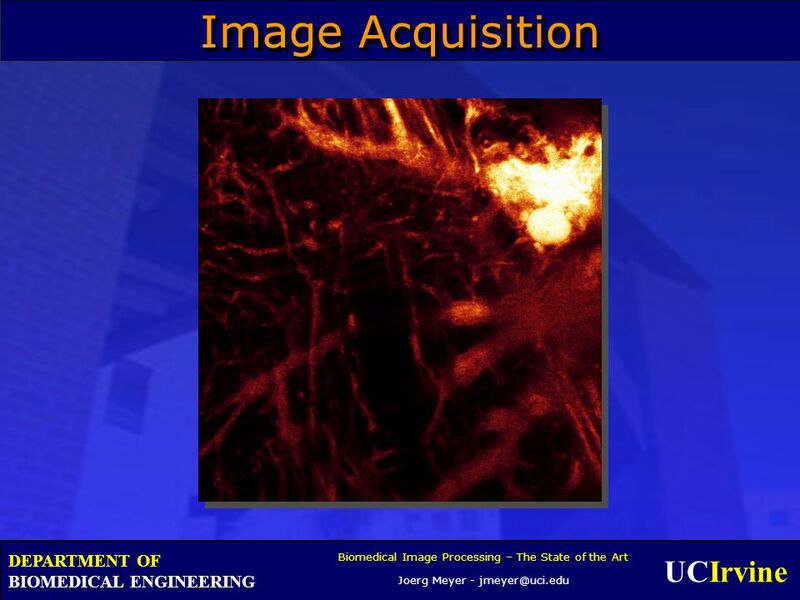 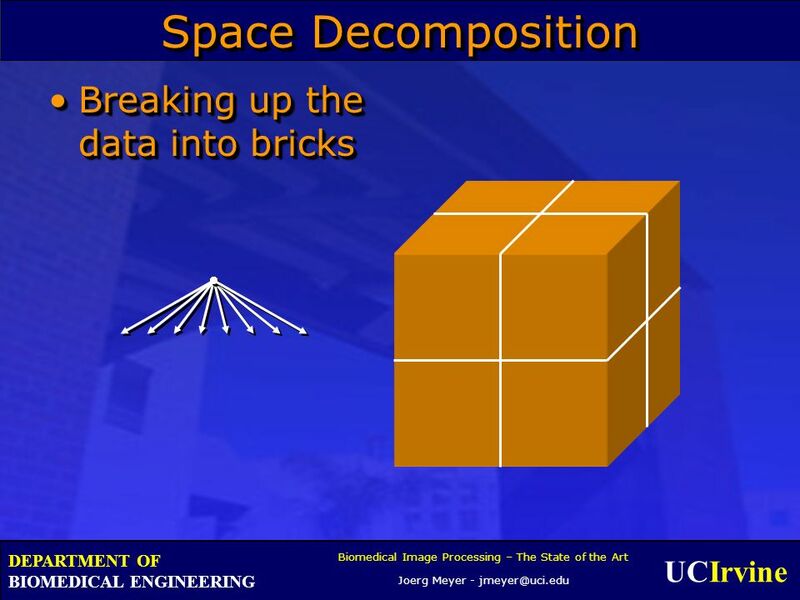 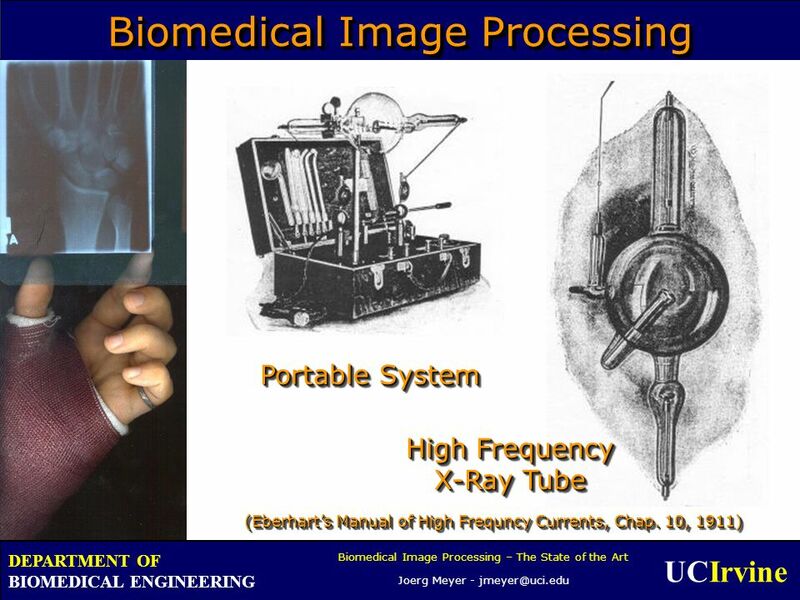 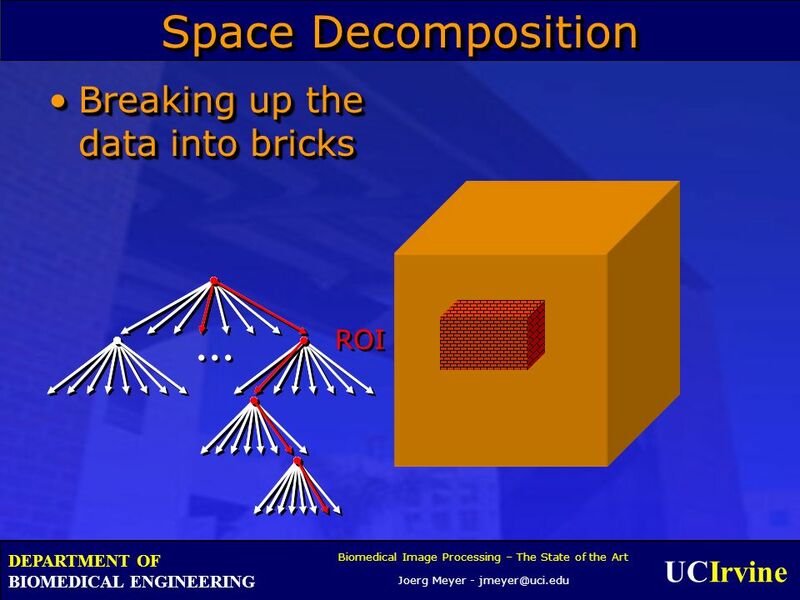 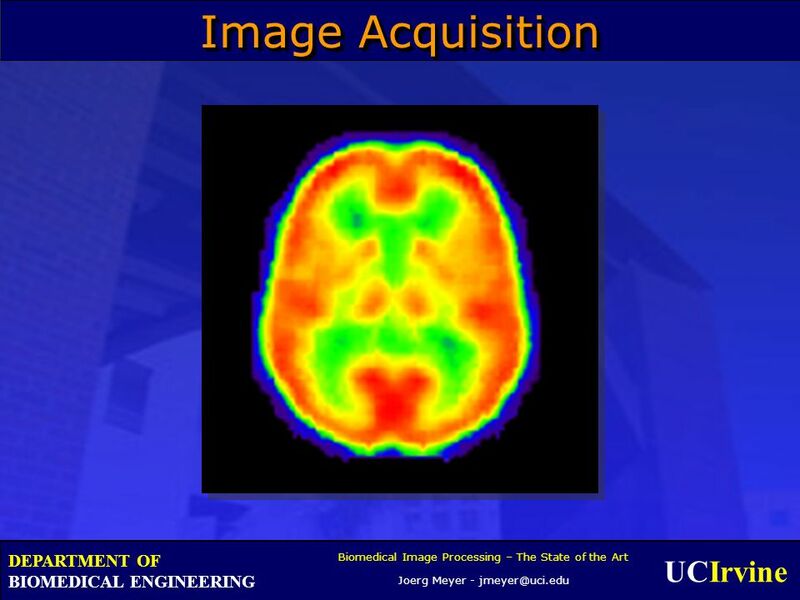 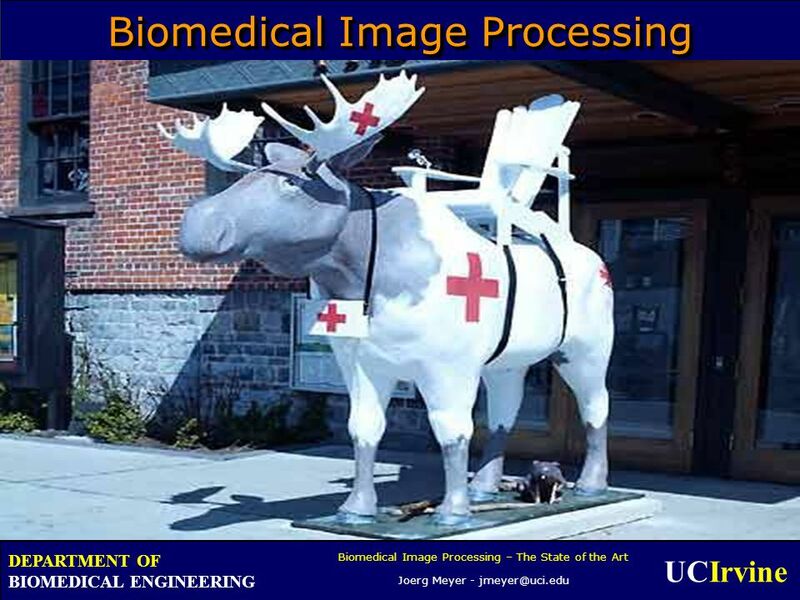 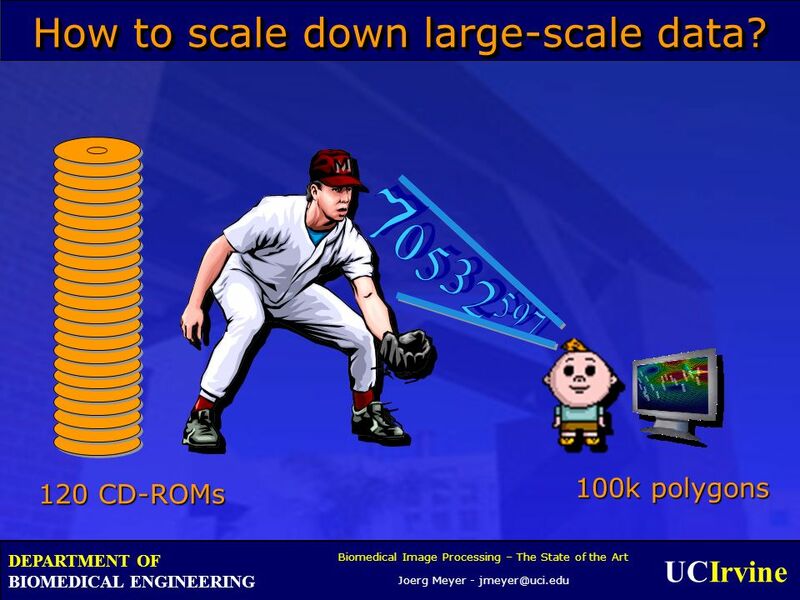 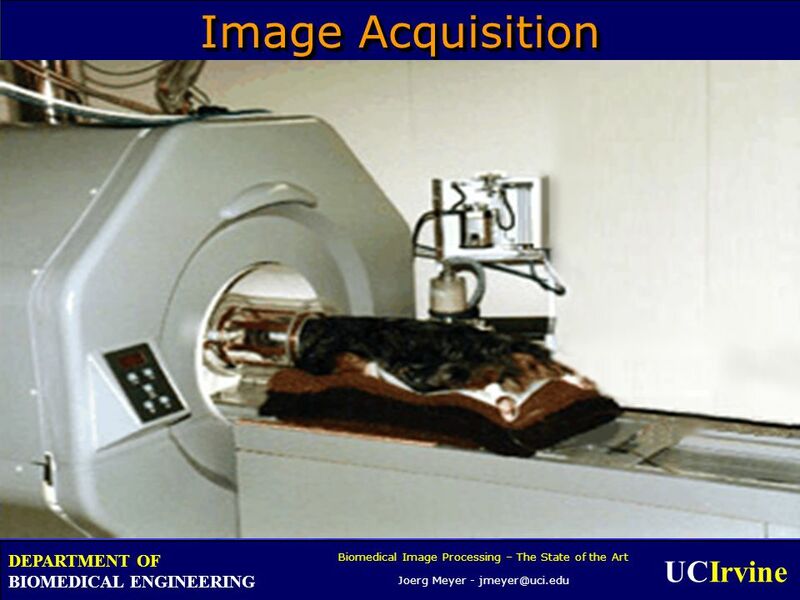 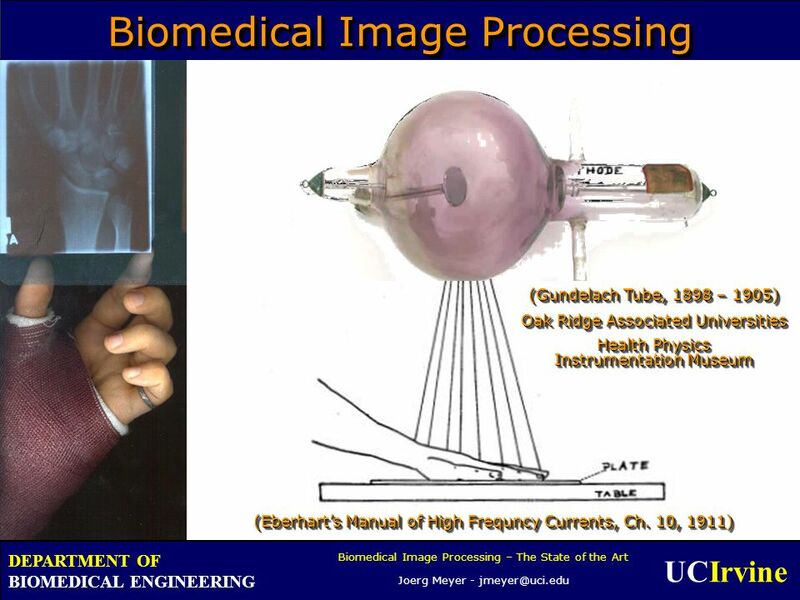 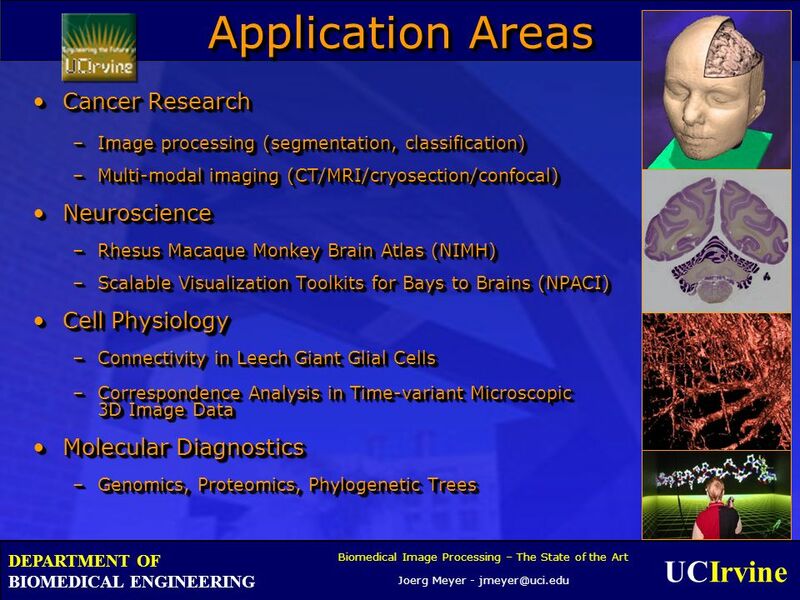 19 UCIrvine Biomedical Image Processing – The State of the Art Joerg Meyer - jmeyer@uci.edu DEPARTMENT OF BIOMEDICAL ENGINEERING Biomedical Image Processing General Question:General Question: –How to combine differentmodalities? General Question:General Question: –How to combine differentmodalities? 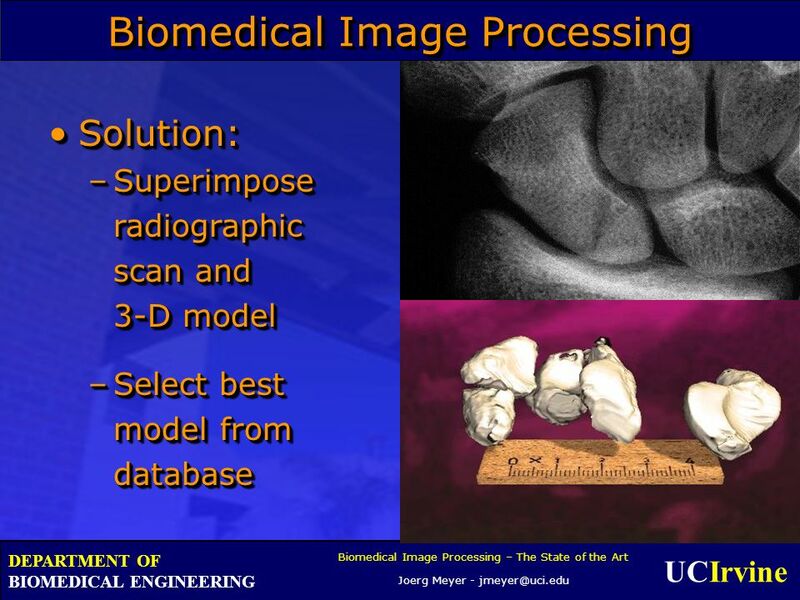 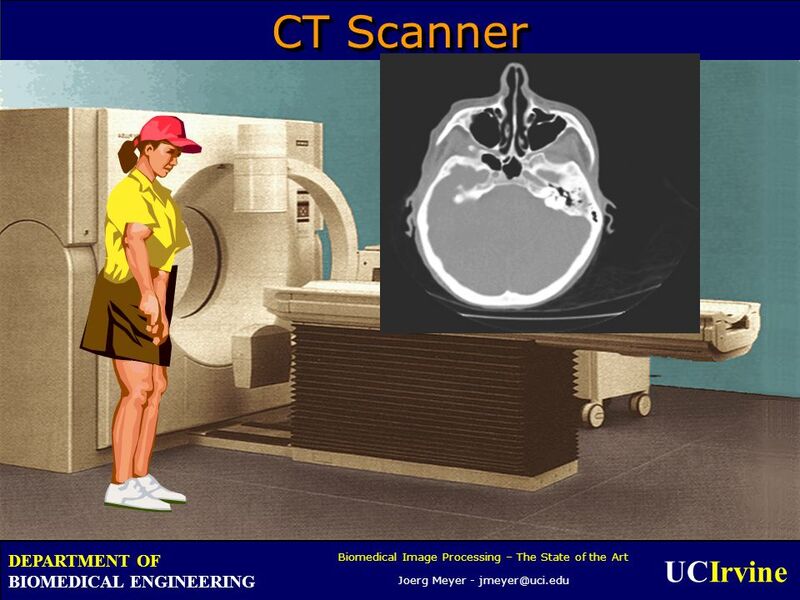 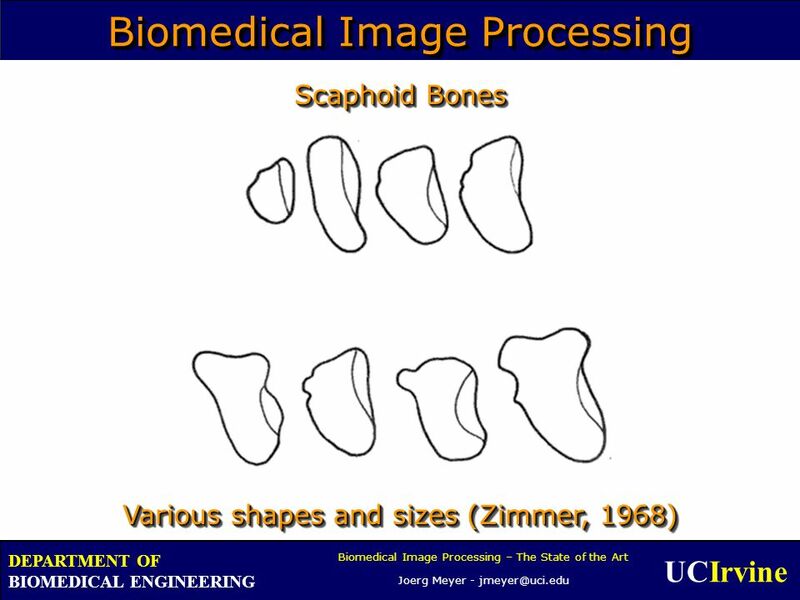 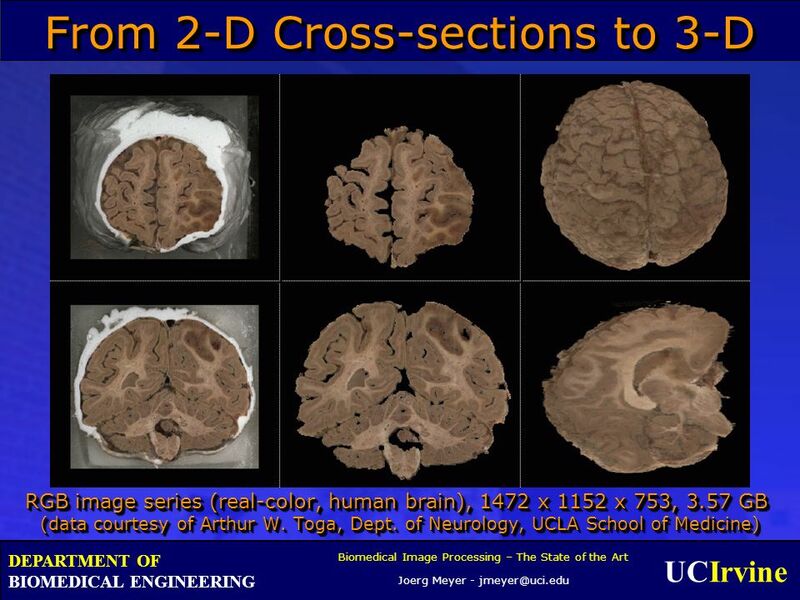 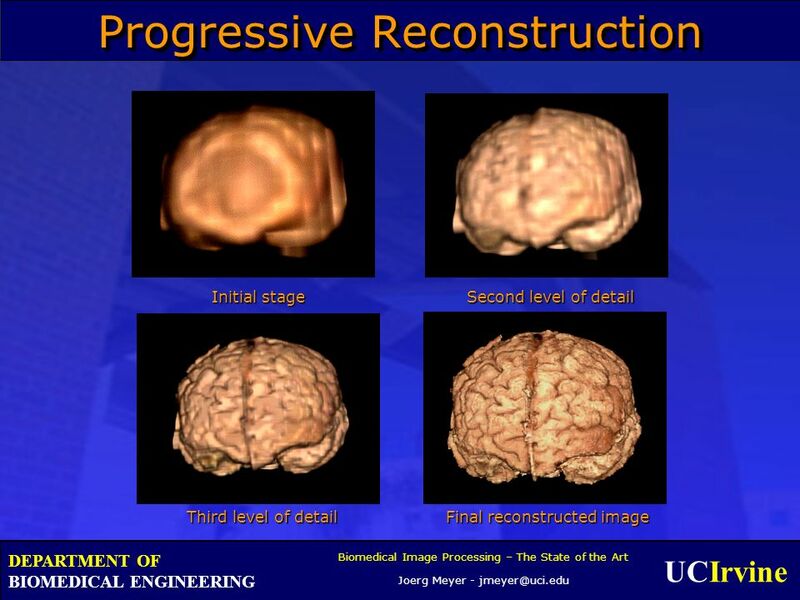 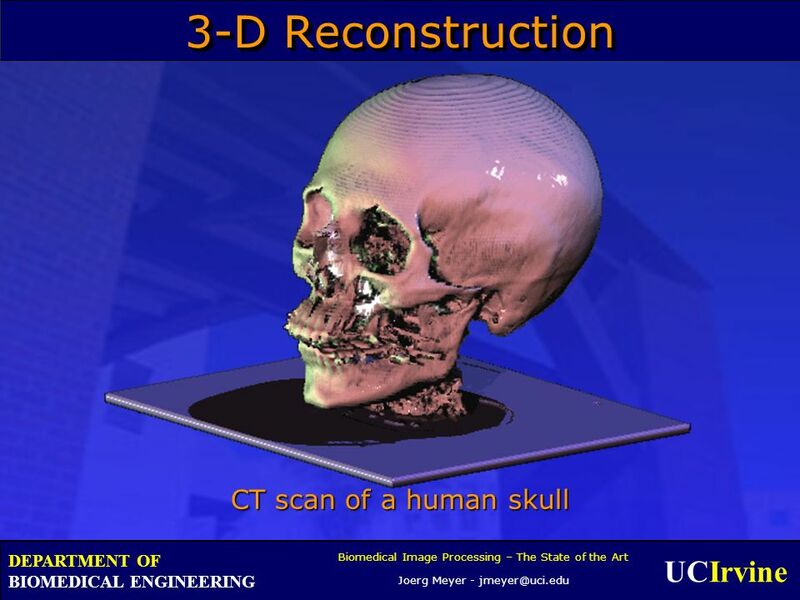 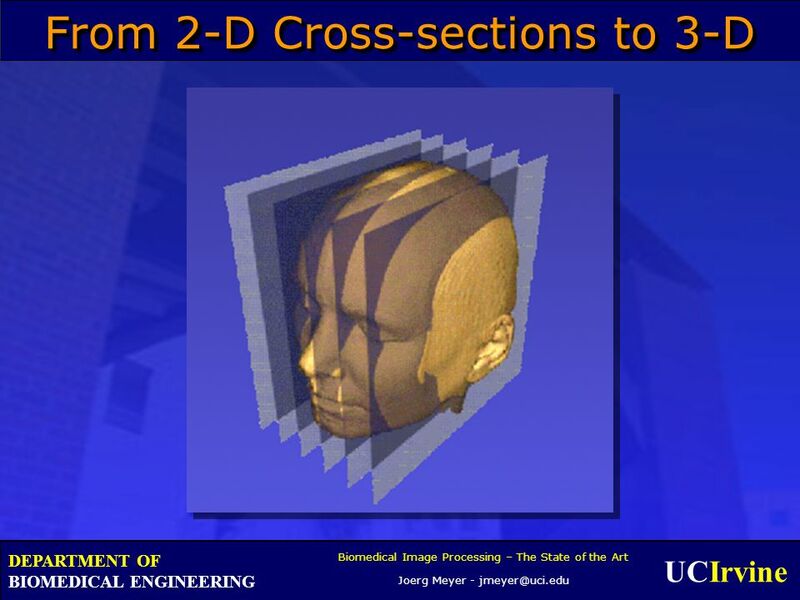 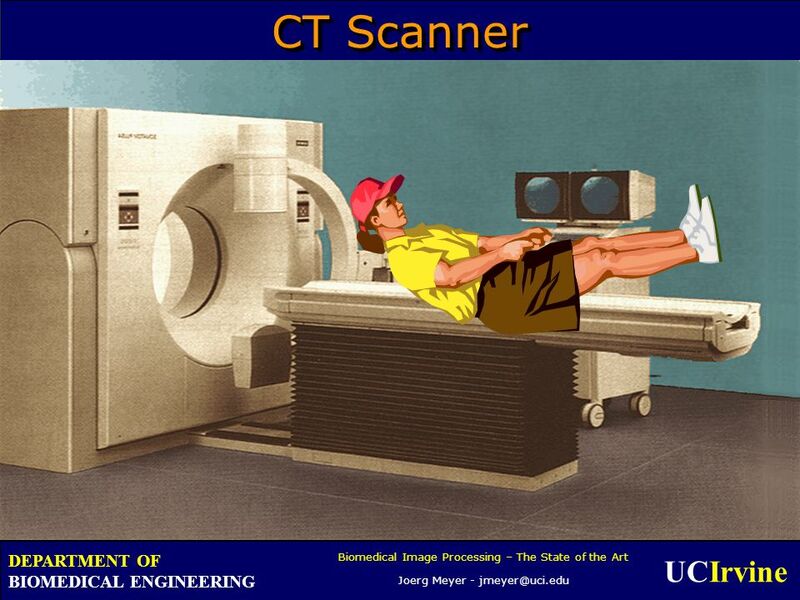 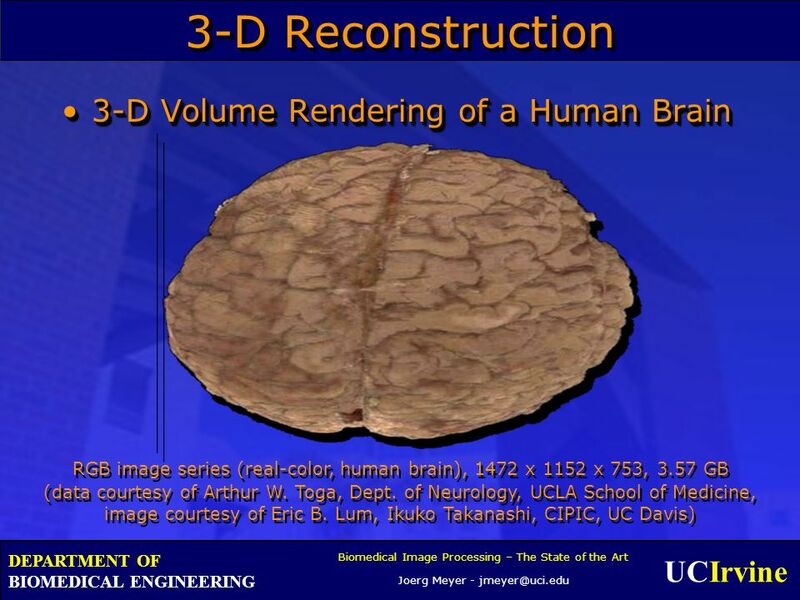 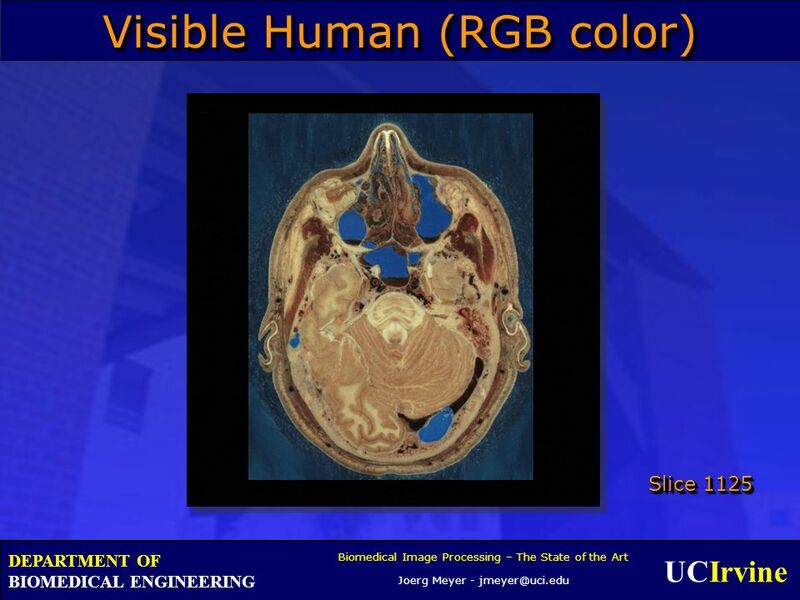 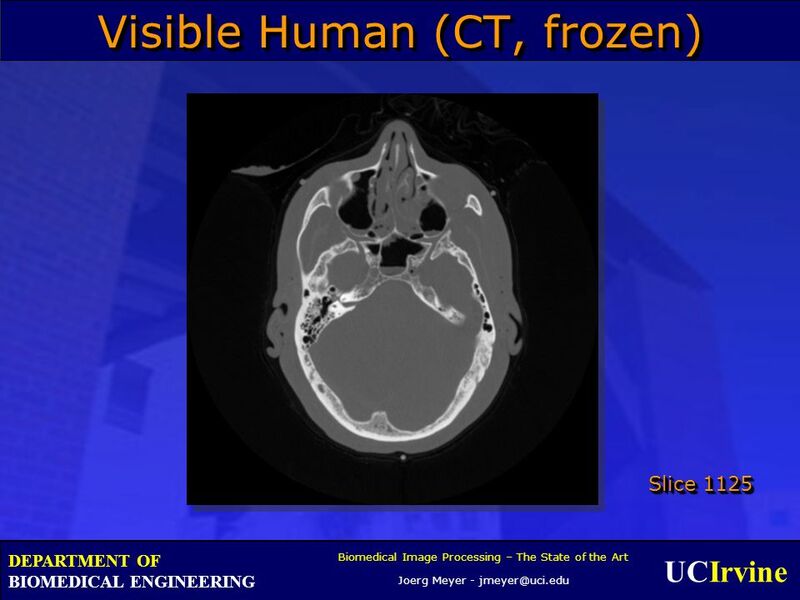 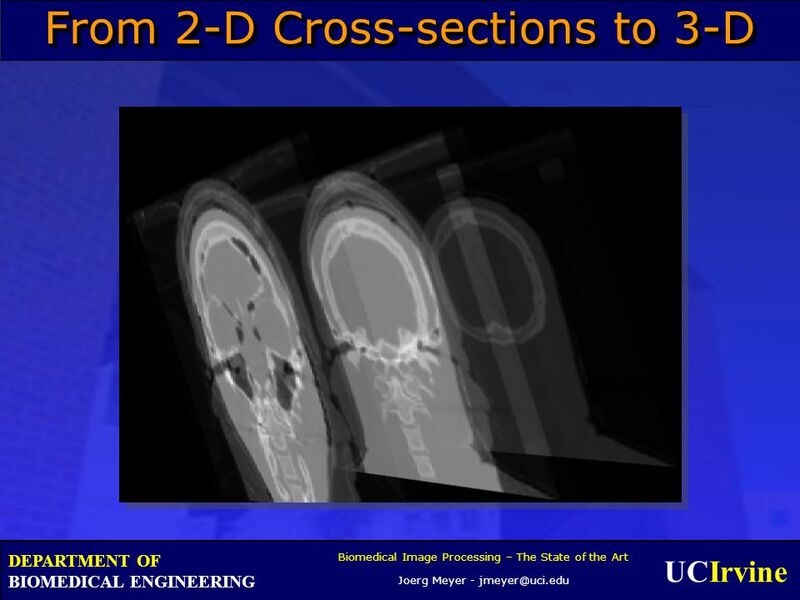 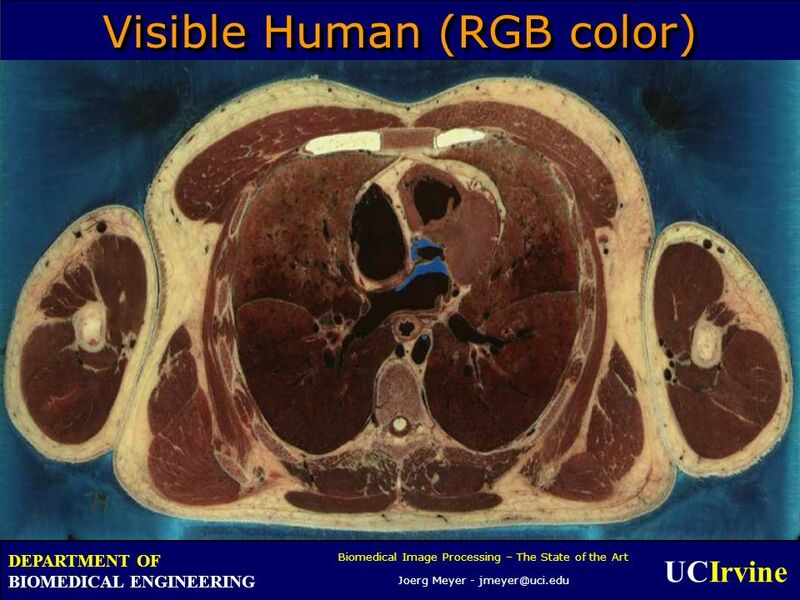 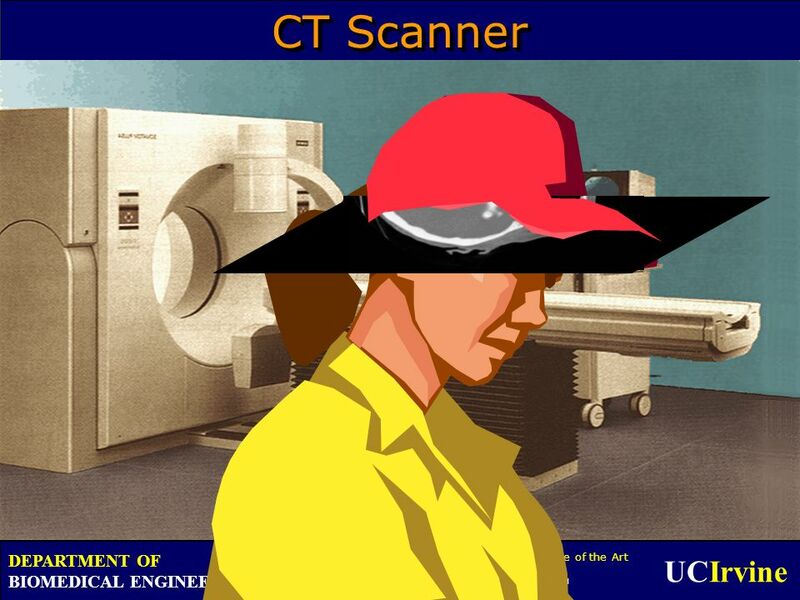 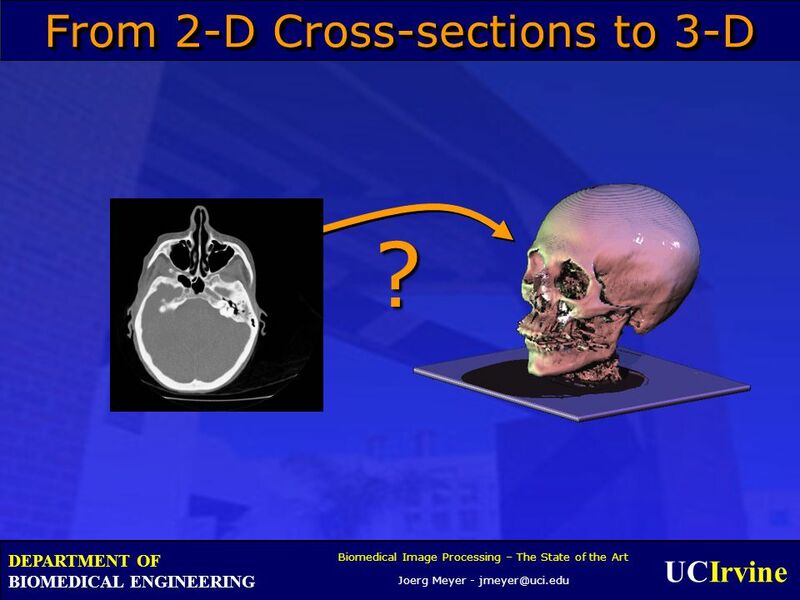 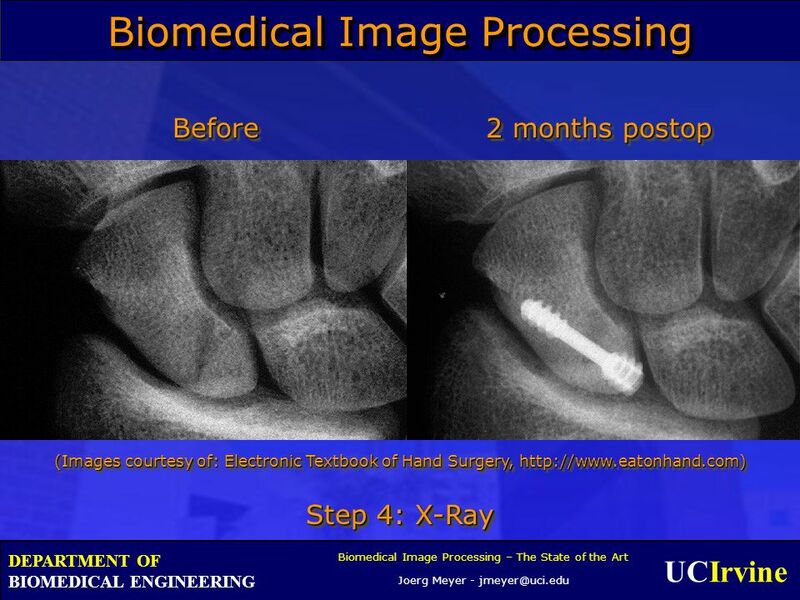 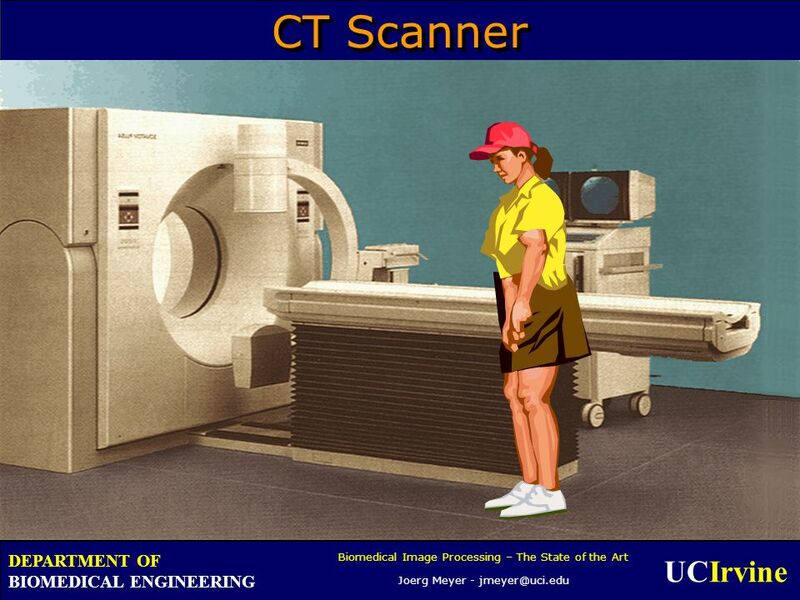 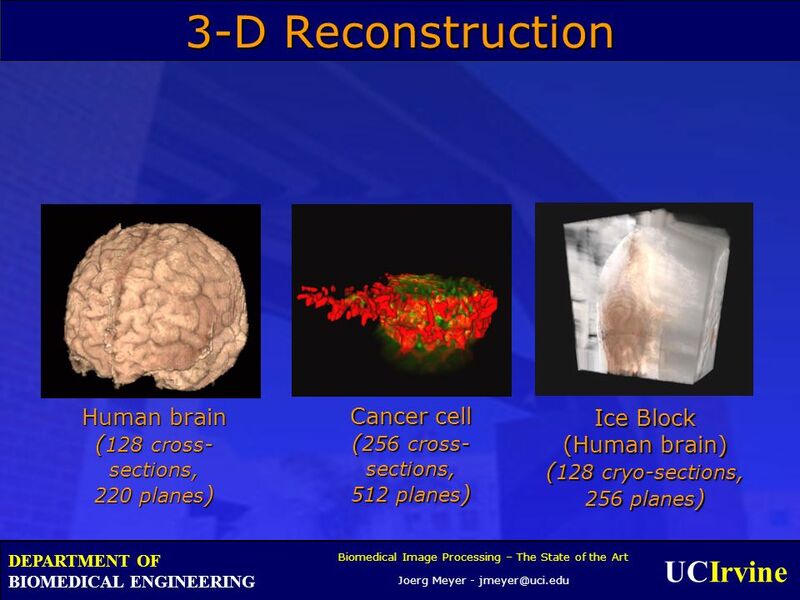 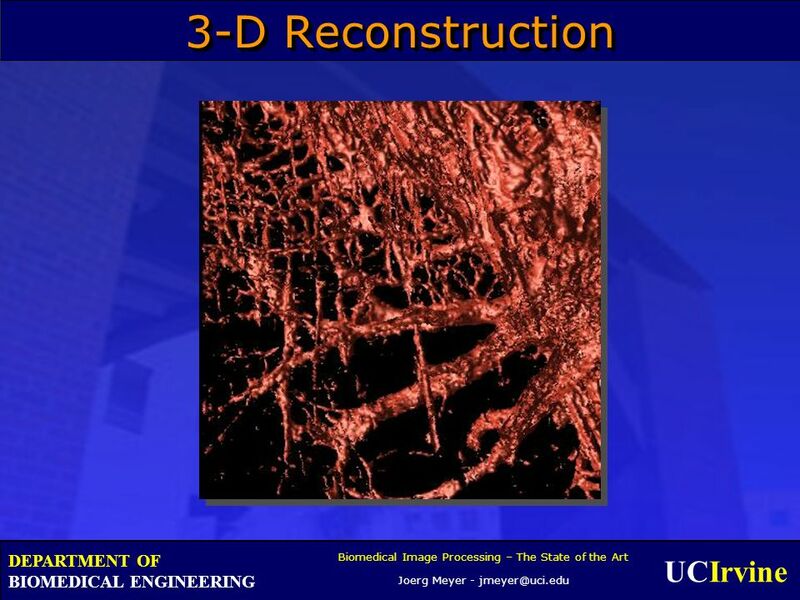 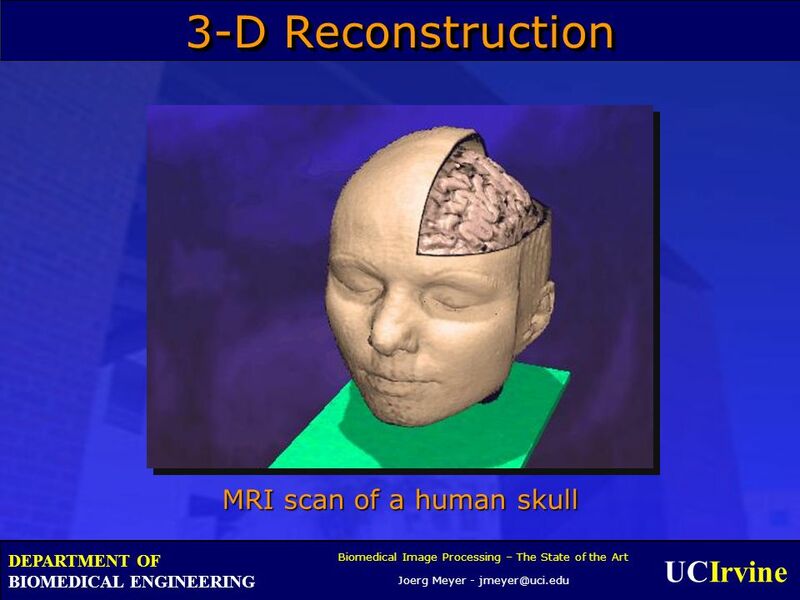 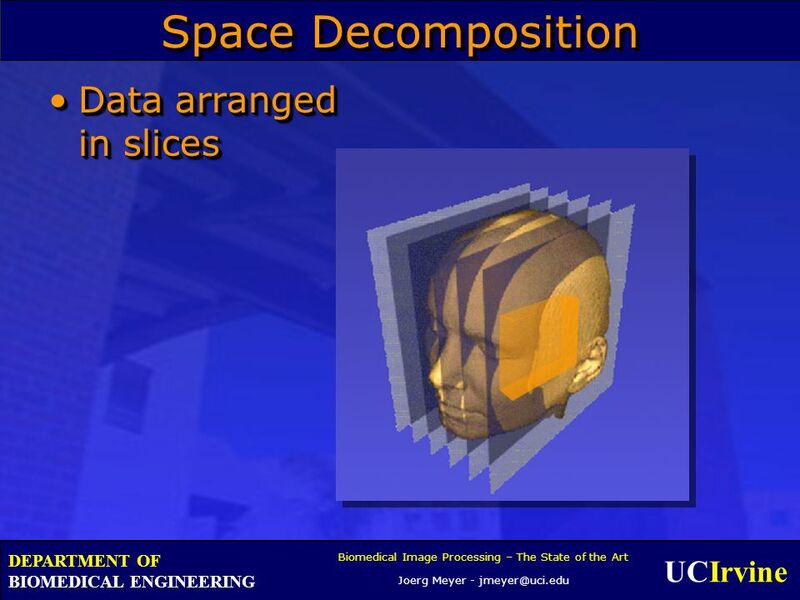 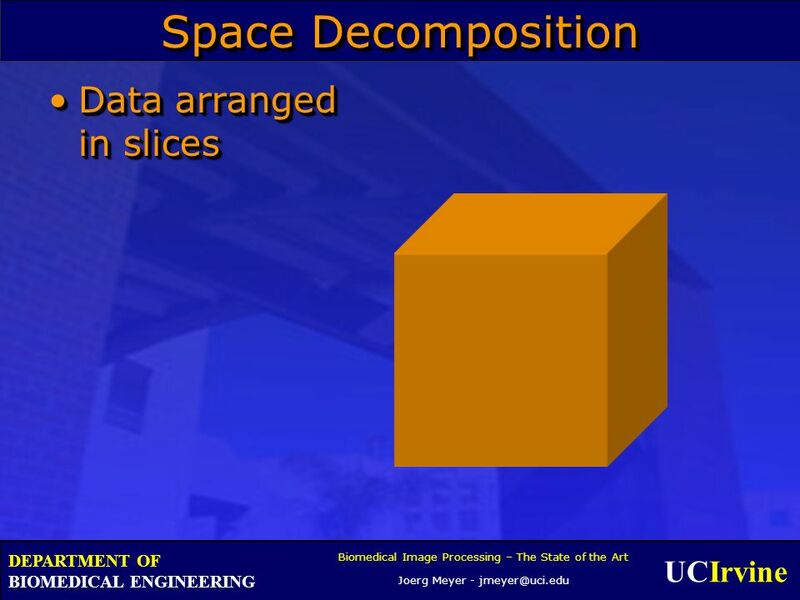 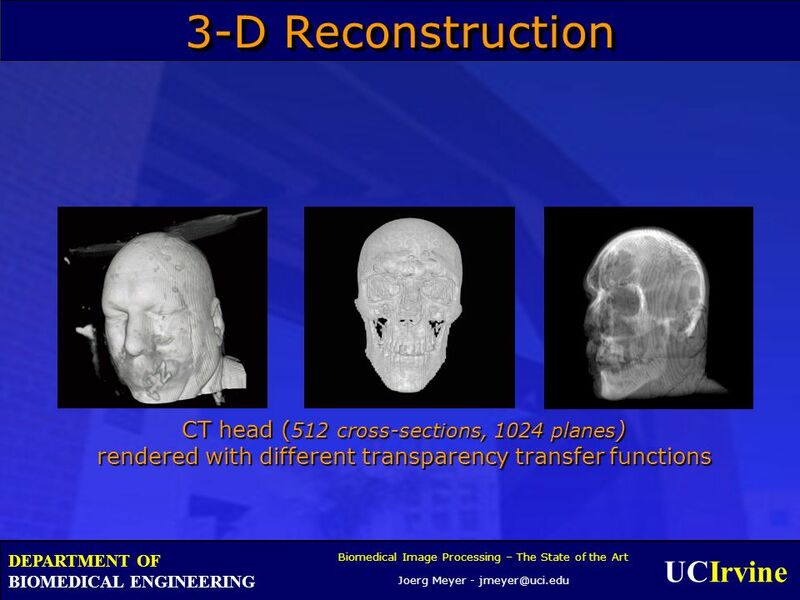 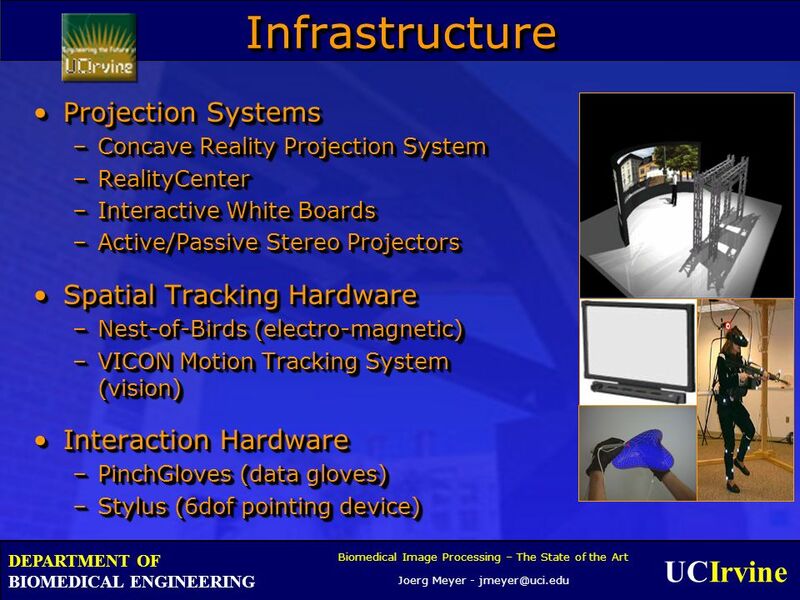 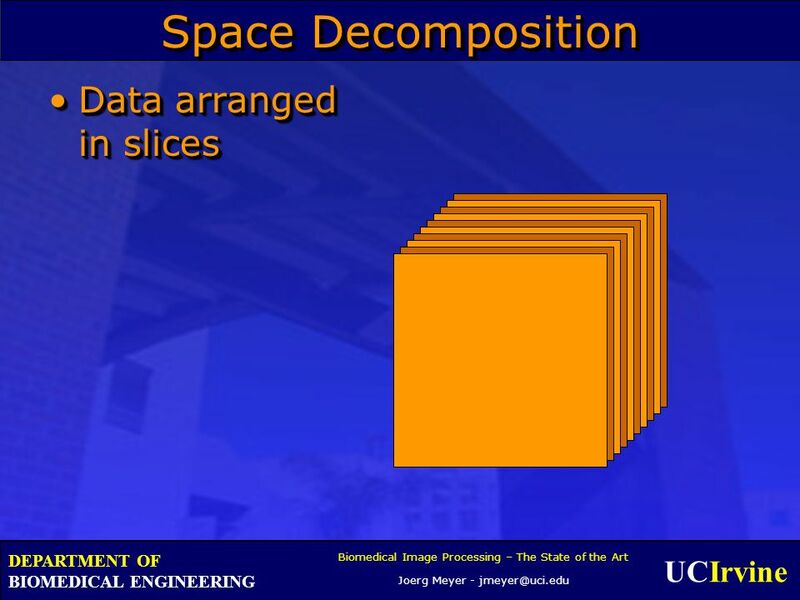 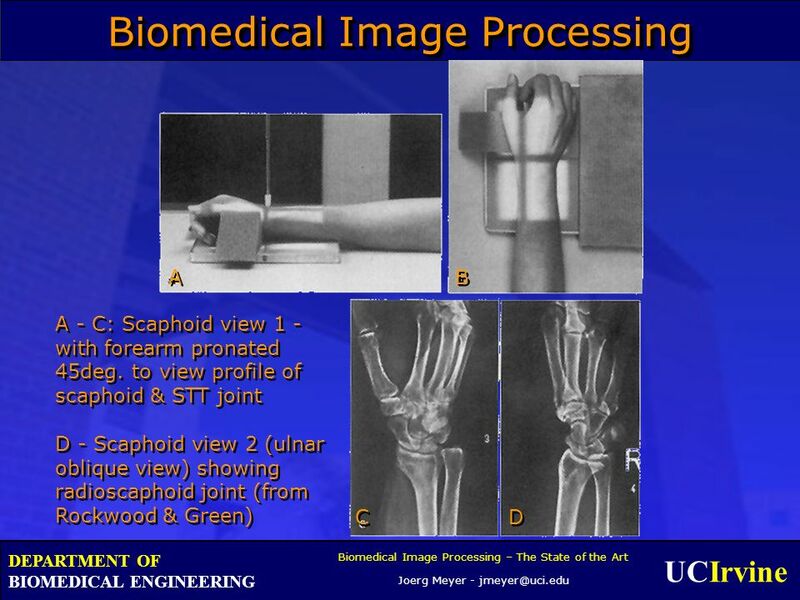 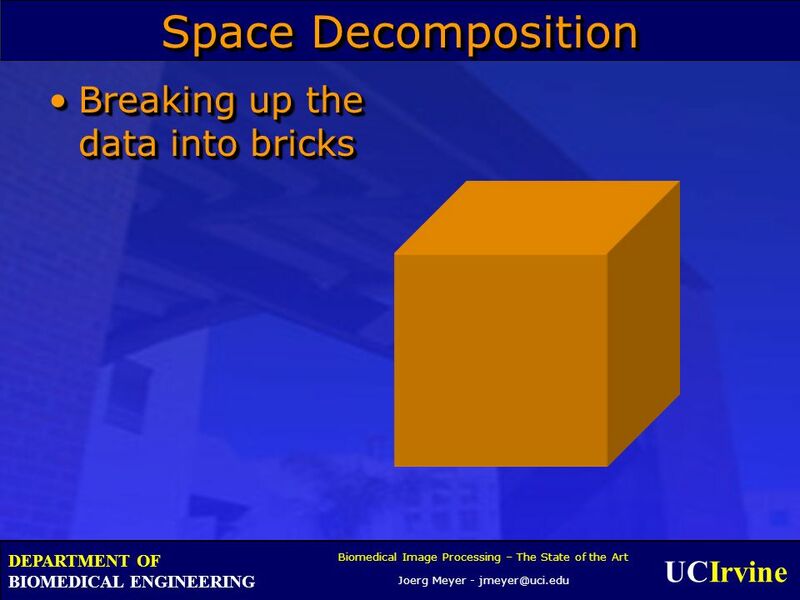 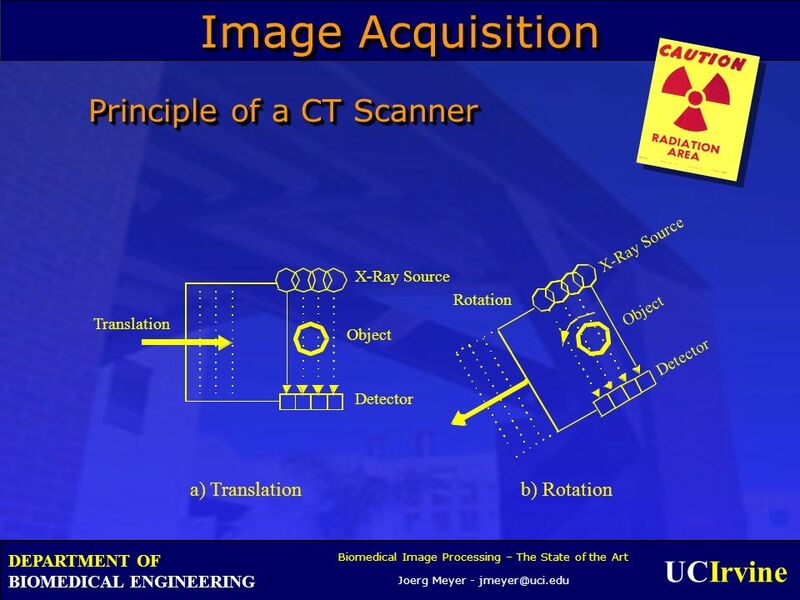 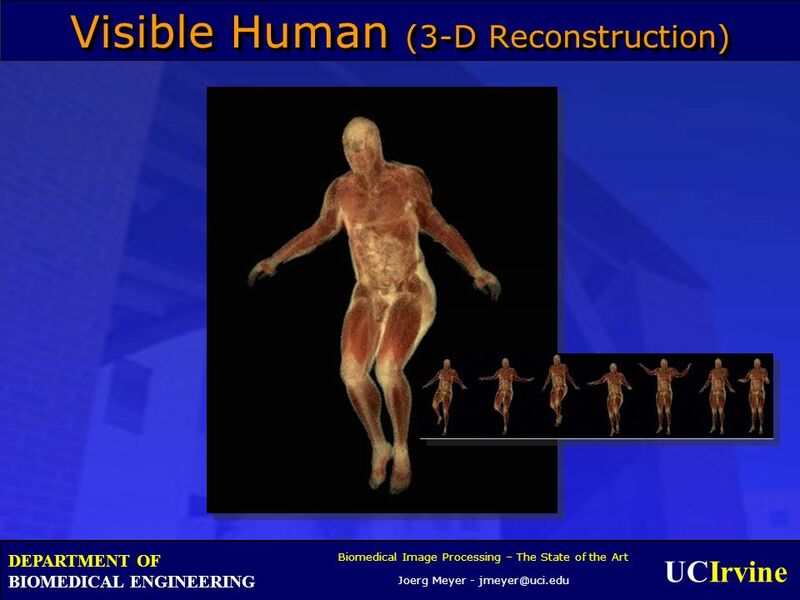 54 UCIrvine Biomedical Image Processing – The State of the Art Joerg Meyer - jmeyer@uci.edu DEPARTMENT OF BIOMEDICAL ENGINEERING From 2-D Cross-sections to 3-D ? 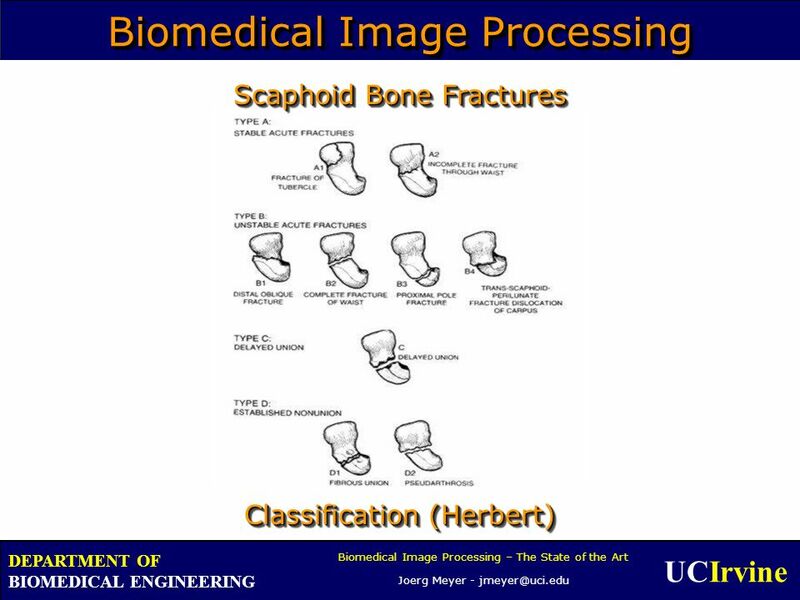 81 UCIrvine Biomedical Image Processing – The State of the Art Joerg Meyer - jmeyer@uci.edu DEPARTMENT OF BIOMEDICAL ENGINEERING AcknowledgementsAcknowledgements Center for Neuroscience,UC DavisCenter for Neuroscience,UC Davis Engineering Research Center, Mississippi State UniversityEngineering Research Center, Mississippi State University Center for Image Processing and Integrated Computing (CIPIC), UC DavisCenter for Image Processing and Integrated Computing (CIPIC), UC Davis The Scripps Research Institute (TSRI), La Jolla, CAThe Scripps Research Institute (TSRI), La Jolla, CA San Diego Supercomputer CenterSan Diego Supercomputer Center These projects are funded in part by the National Institute of Mental Health (NIMH) through the Center for Neuroscience at UC Davis, and the National Partnership for Advanced Computational Infrastructure (NPACI) (award #10195430 00120410).These projects are funded in part by the National Institute of Mental Health (NIMH) through the Center for Neuroscience at UC Davis, and the National Partnership for Advanced Computational Infrastructure (NPACI) (award #10195430 00120410). 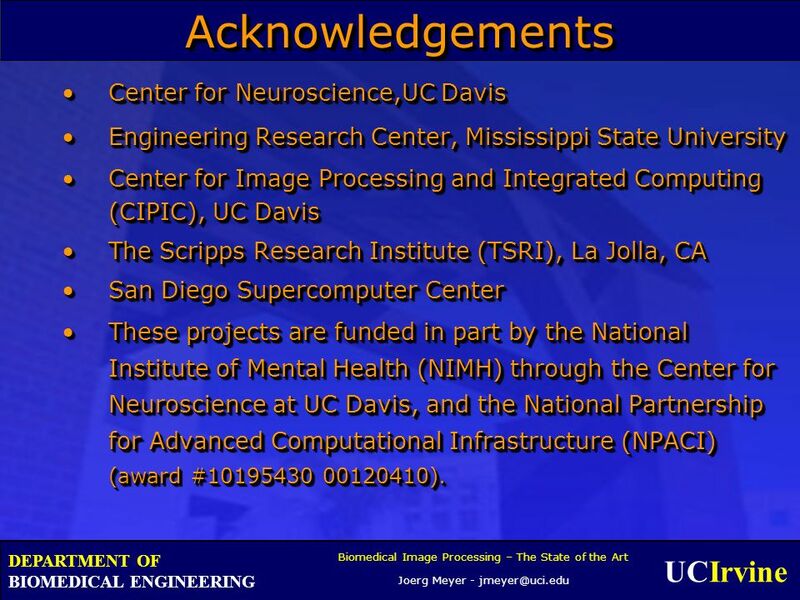 Center for Neuroscience,UC DavisCenter for Neuroscience,UC Davis Engineering Research Center, Mississippi State UniversityEngineering Research Center, Mississippi State University Center for Image Processing and Integrated Computing (CIPIC), UC DavisCenter for Image Processing and Integrated Computing (CIPIC), UC Davis The Scripps Research Institute (TSRI), La Jolla, CAThe Scripps Research Institute (TSRI), La Jolla, CA San Diego Supercomputer CenterSan Diego Supercomputer Center These projects are funded in part by the National Institute of Mental Health (NIMH) through the Center for Neuroscience at UC Davis, and the National Partnership for Advanced Computational Infrastructure (NPACI) (award #10195430 00120410).These projects are funded in part by the National Institute of Mental Health (NIMH) through the Center for Neuroscience at UC Davis, and the National Partnership for Advanced Computational Infrastructure (NPACI) (award #10195430 00120410). 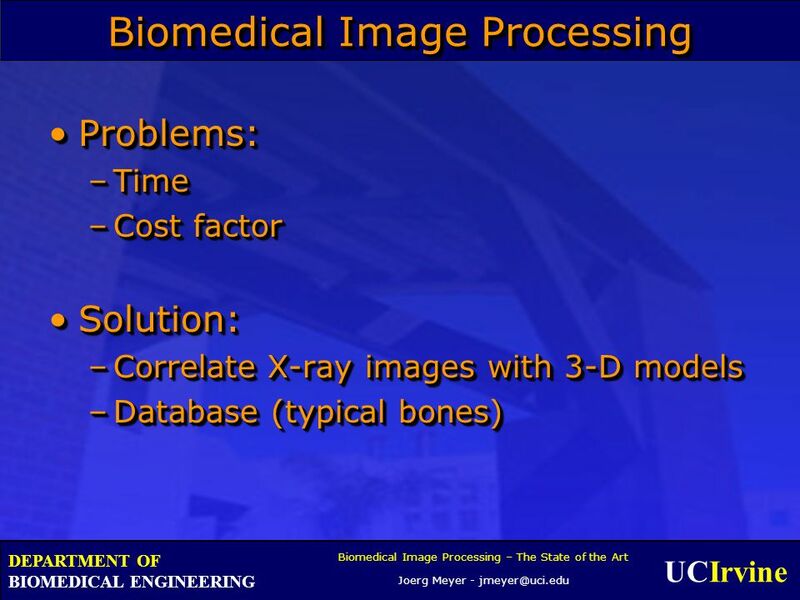 82 UCIrvine Biomedical Image Processing – The State of the Art Joerg Meyer - jmeyer@uci.edu DEPARTMENT OF BIOMEDICAL ENGINEERING Thats all, folks! 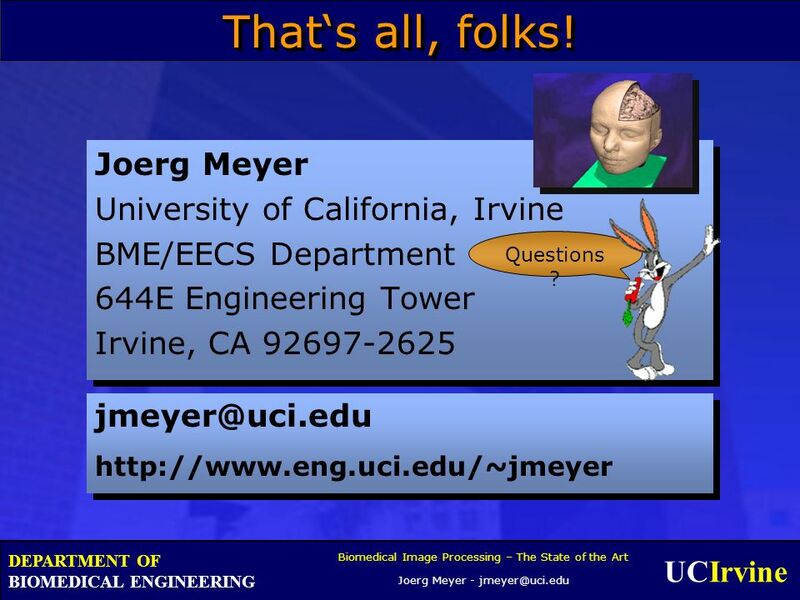 Joerg Meyer University of California, Irvine BME/EECS Department 644E Engineering Tower Irvine, CA 92697-2625 jmeyer@uci.edu http://www.eng.uci.edu/~jmeyer Joerg Meyer University of California, Irvine BME/EECS Department 644E Engineering Tower Irvine, CA 92697-2625 jmeyer@uci.edu http://www.eng.uci.edu/~jmeyer Questions ? 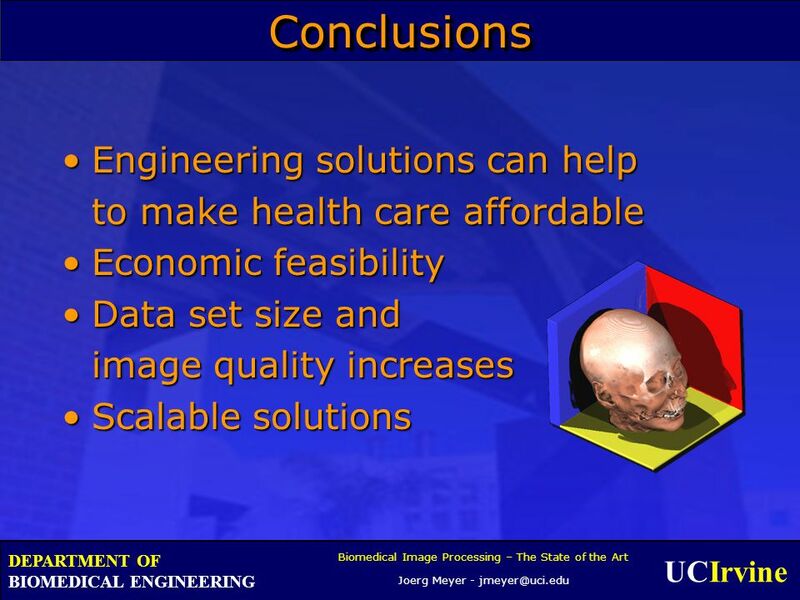 Download ppt "UCIrvine DEPARTMENT OF BIOMEDICAL ENGINEERING The State of the Art Joerg Meyer February 8, 2014February 8, 2014February 8, 2014 Joerg Meyer." 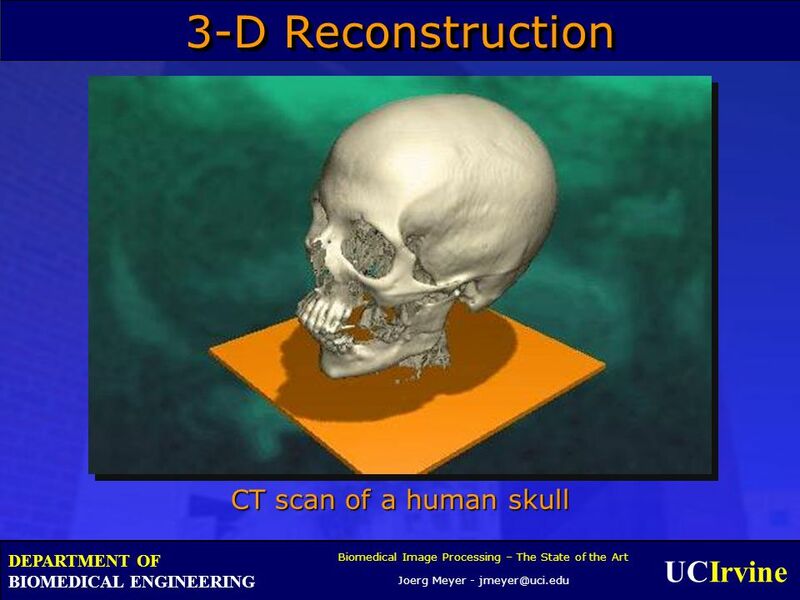 3-D. 3-D IMAGING IN MEDICINE IS A METHOD IN WHICH A SET OF DATA IS COLLECTED FROM A 3- D OBJECT, PROCESSED BY A COMPUTER, AND DISPALAYED ON A 2-D COMPUTER. 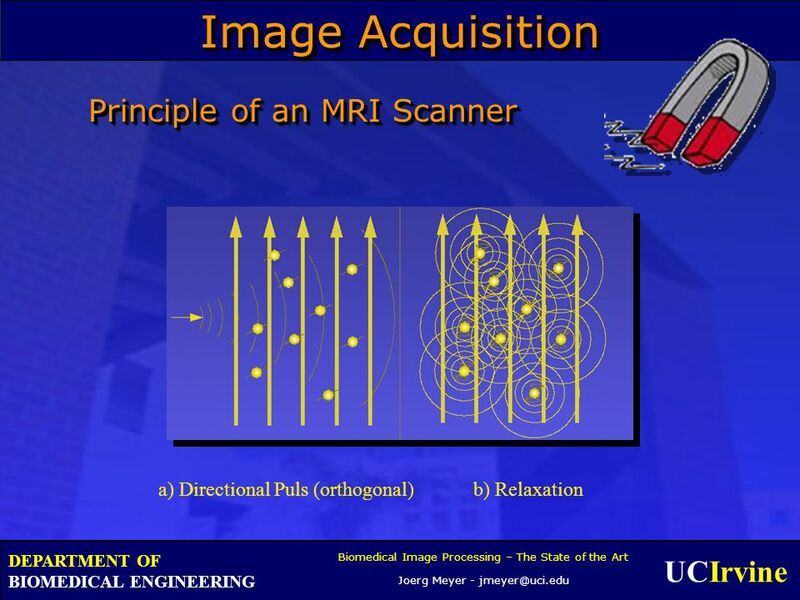 Portable Magnetic Resonance Devices. 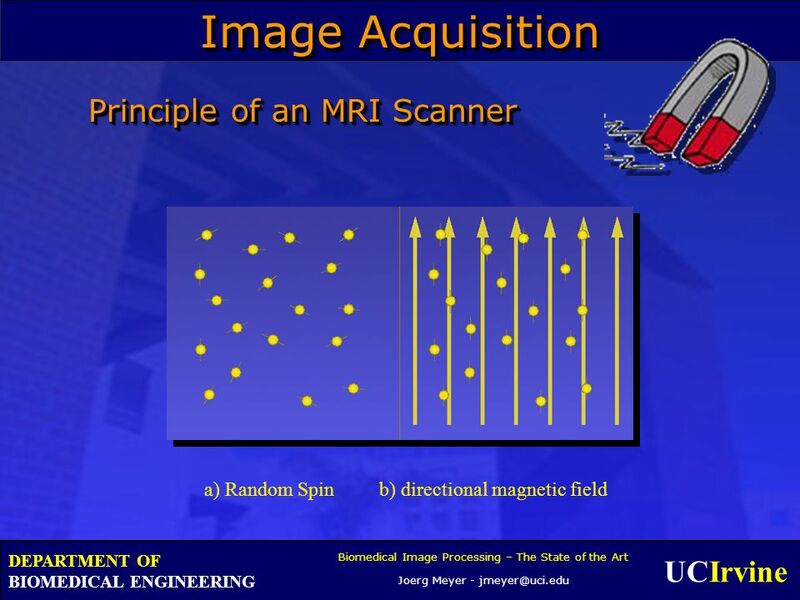 NMR A spinning magnet in a magnetic field will precess Larmor frequency ω = γ B Resonance – absorb energy Radio frequency. 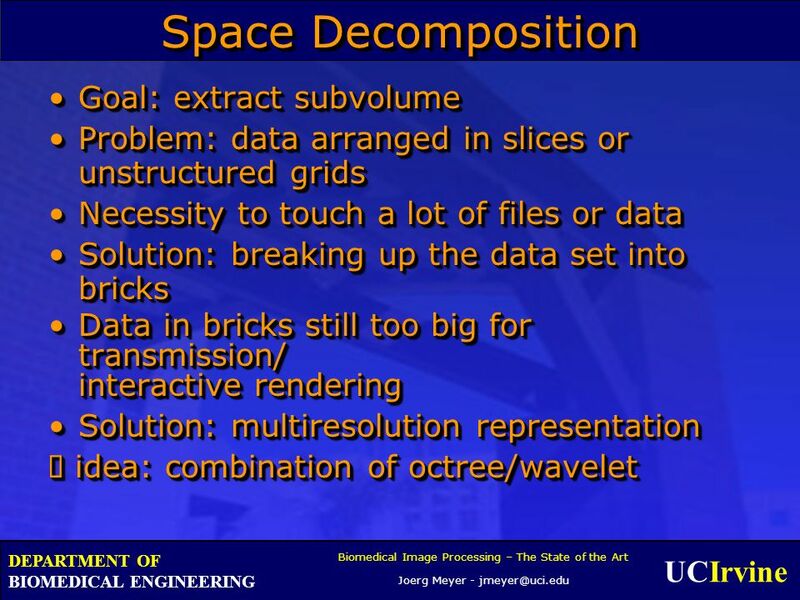 7.1 Vis_04 Data Visualization Lecture 7 3D Scalar Visualization Part 2 : Volume Rendering- Introduction. 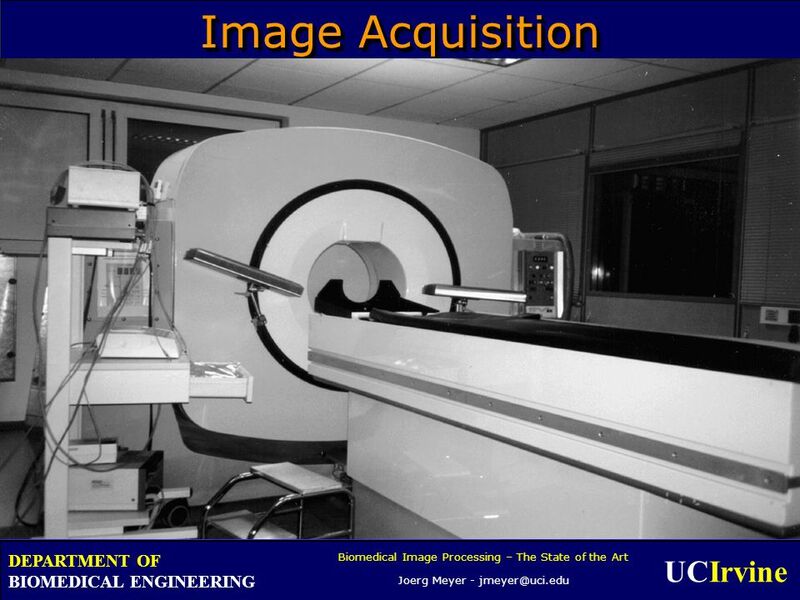 Impact of various imaging modalities on PACS archiving and storage Eugene Mah, M.Sc. 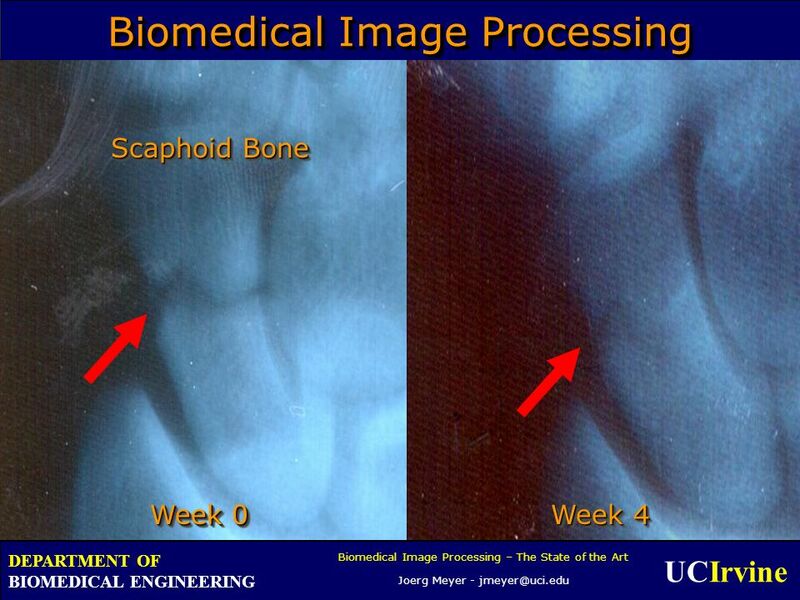 Jay Crawford, MHA Medical University of South Carolina. 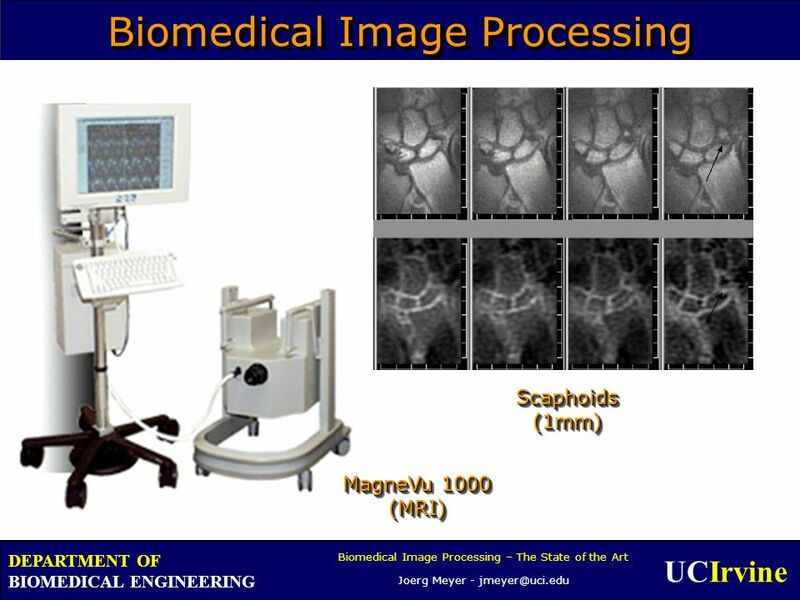 School of Biomedical Engineering, Science & Health Systems V 1.0 SD  NANOSCALE COHERENCE TECHNIQUES FOR X-RAY IMAGING PROGRAM. 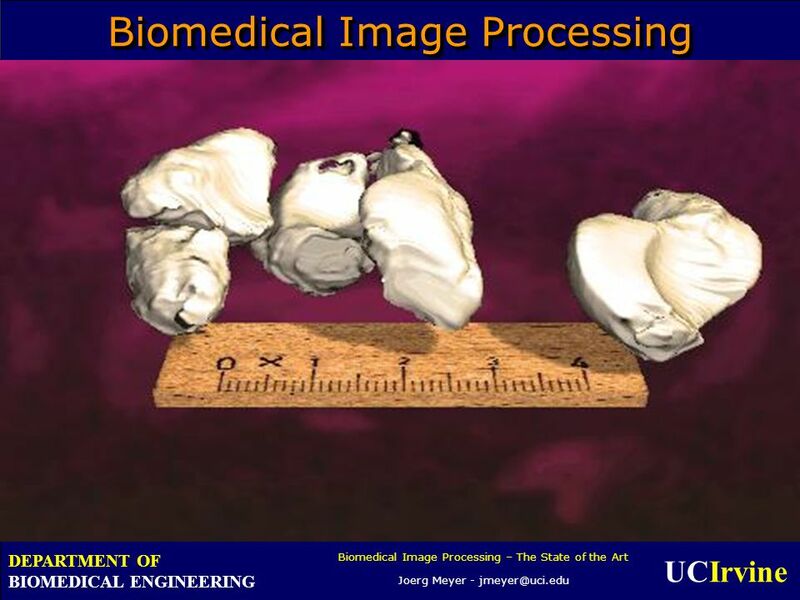 School of Biomedical Engineering, Science & Health Systems WWW.BIOMED.DREXEL.EDU V 1.0 SD  NANOSCALE COHERENCE TECHNIQUES FOR X-RAY IMAGING PROGRAM.